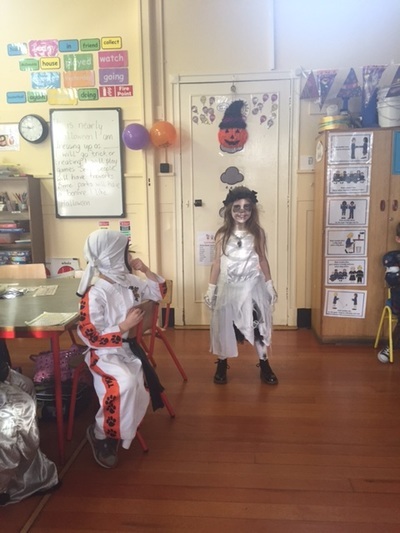 Our room was action packed on Friday! 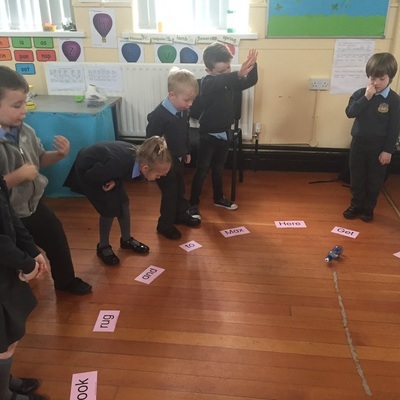 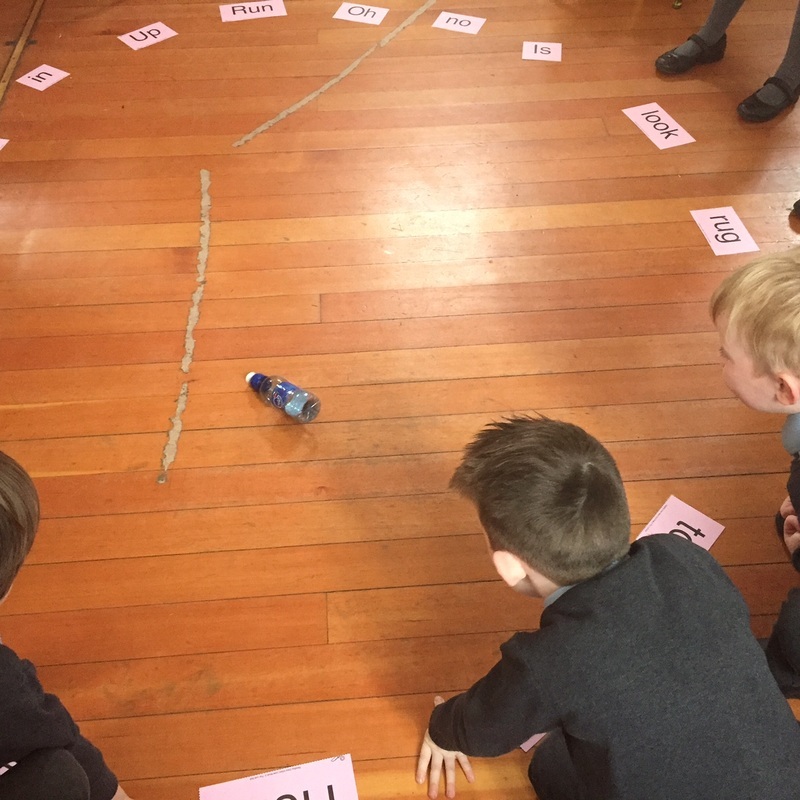 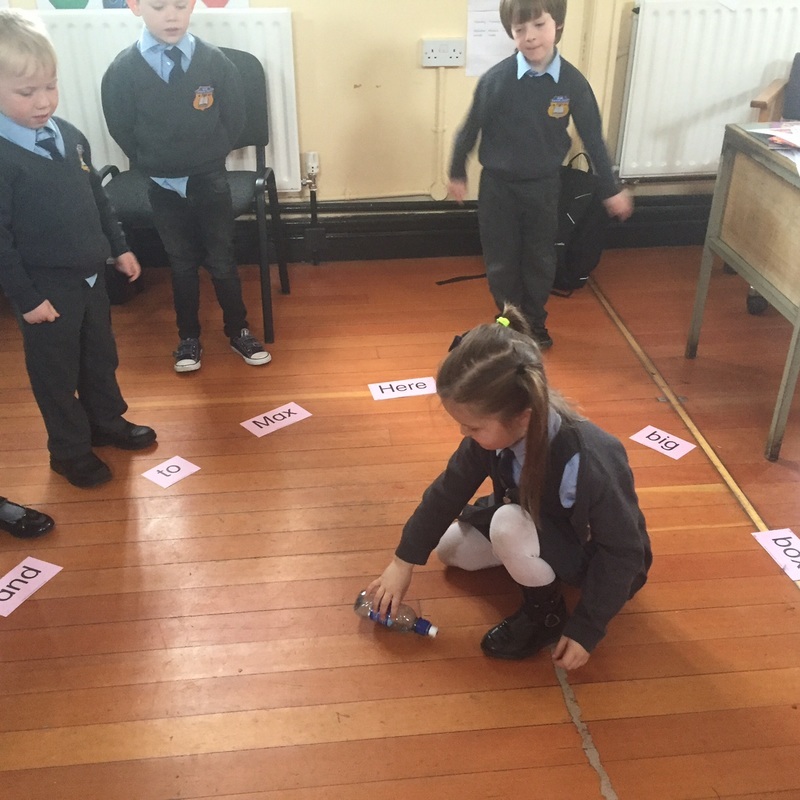 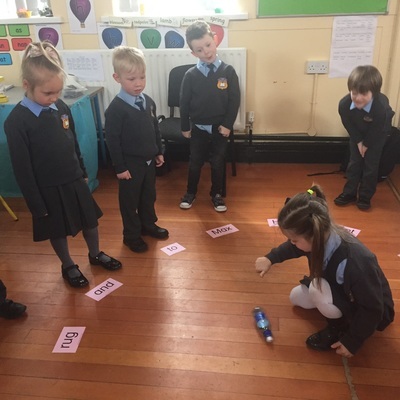 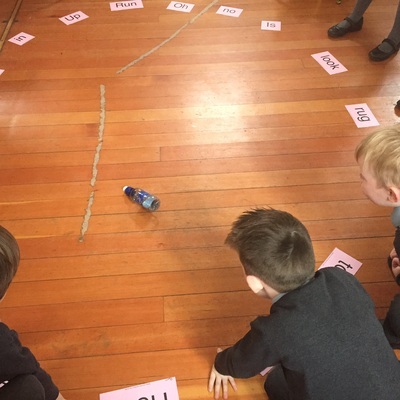 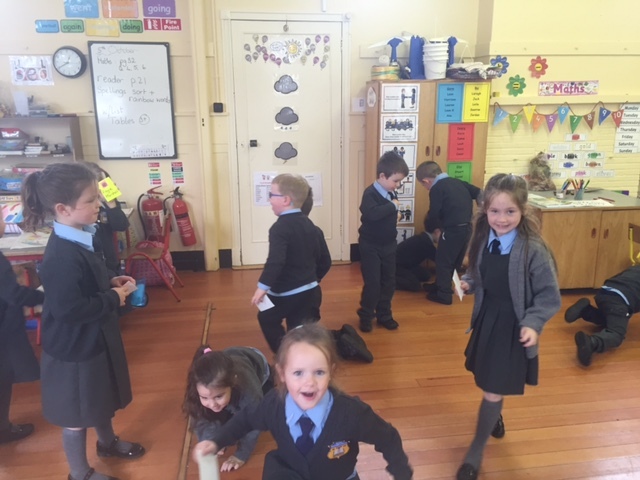 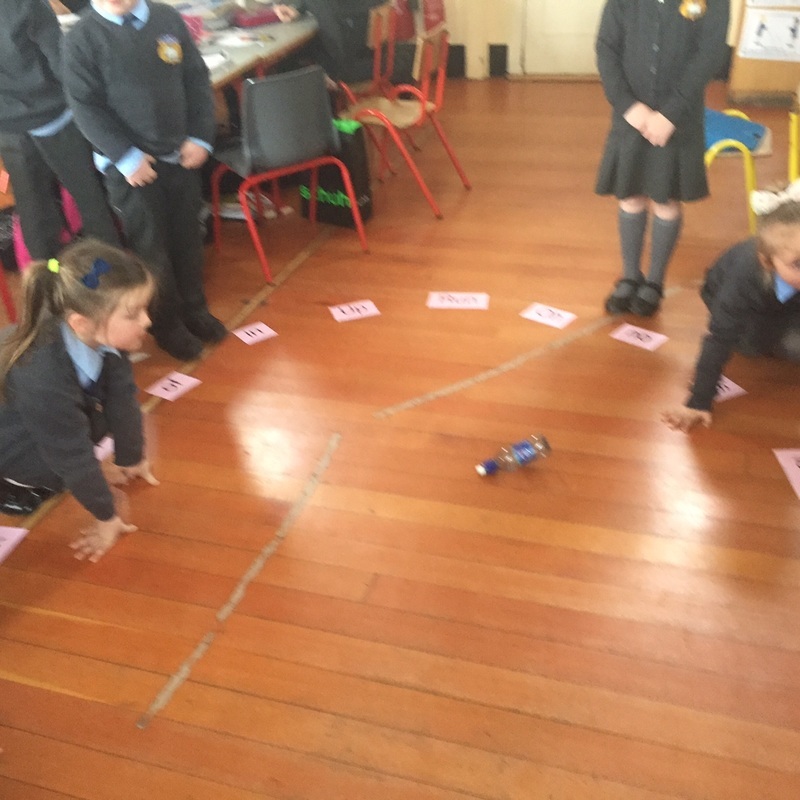 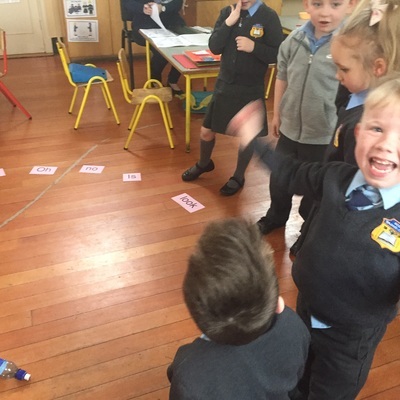 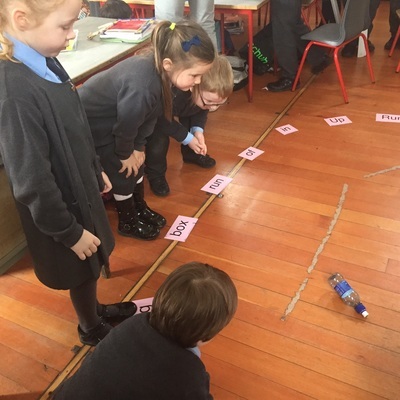 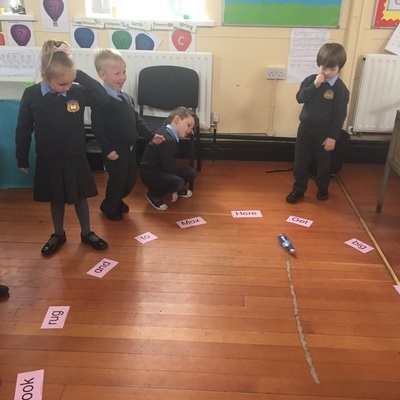 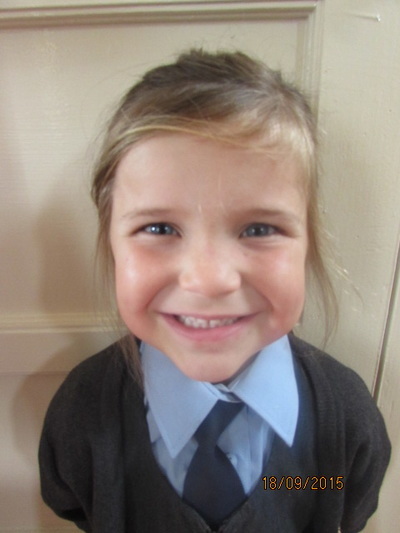 Alicia our Spanish helper was working on Art with the children throughout the day, Mr Gubbins and the 1st and 2nd were very busy measuring length and width around the room and the infants had great fun playing a spin the bottle word game!!! 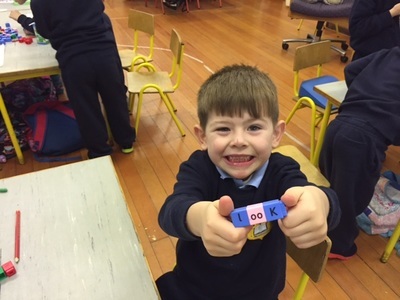 Great fun!!!! 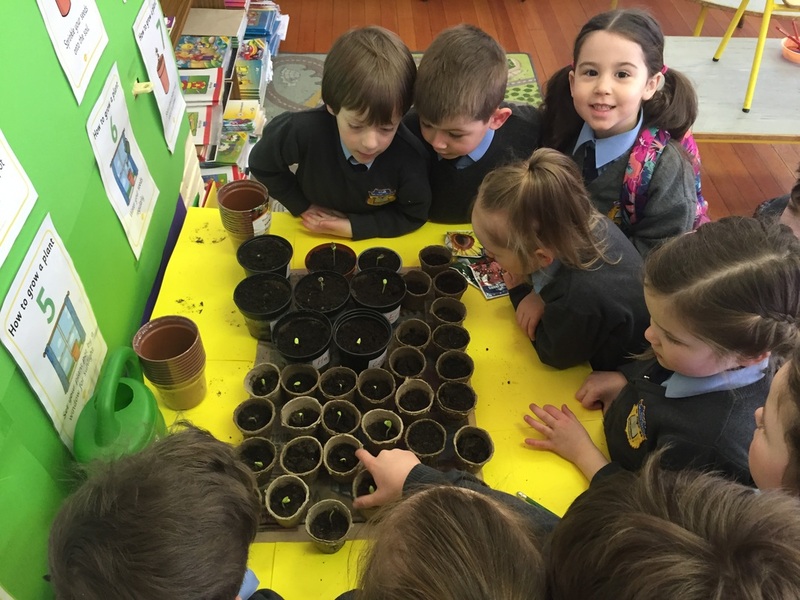 Sunflowers seeds have sprouted and growing well! 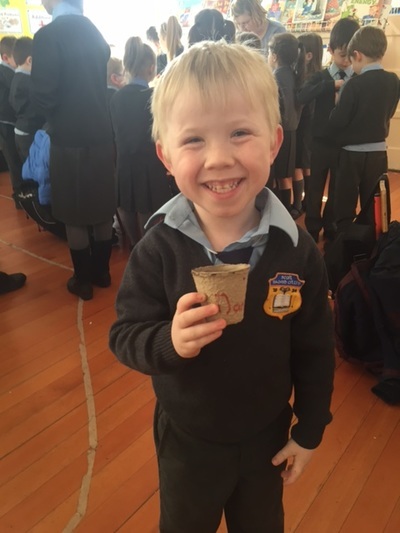 A big thank you to Jillian and Jamie who are watering them regularly! 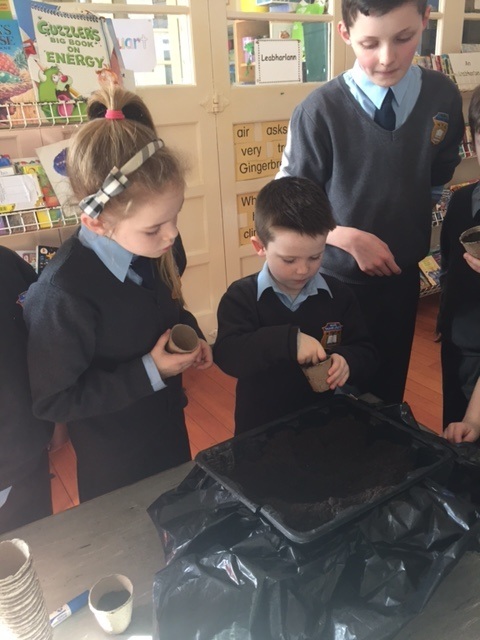 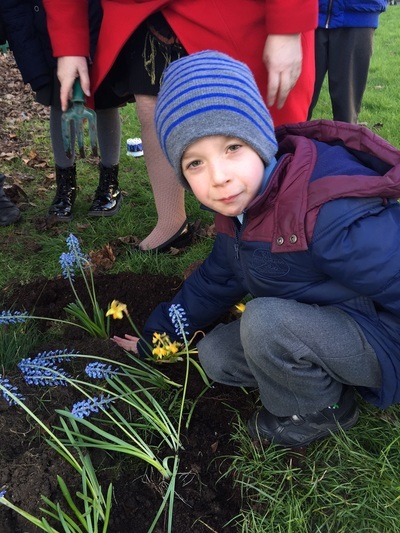 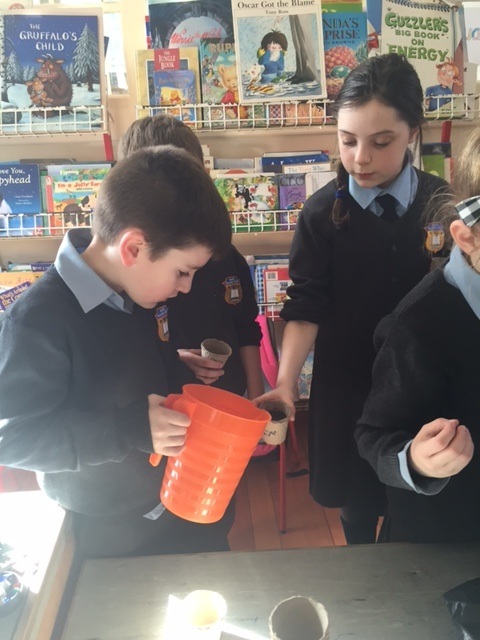 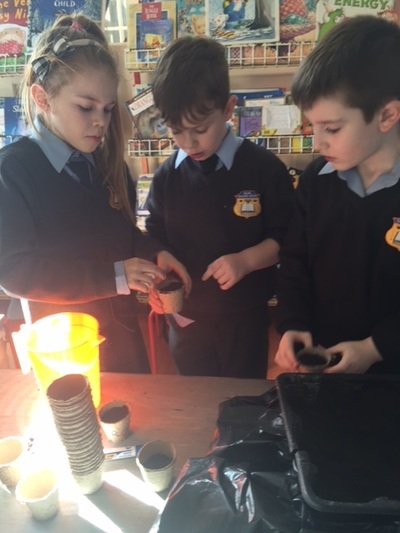 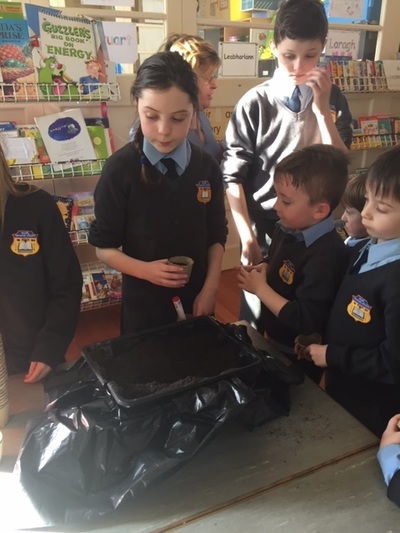 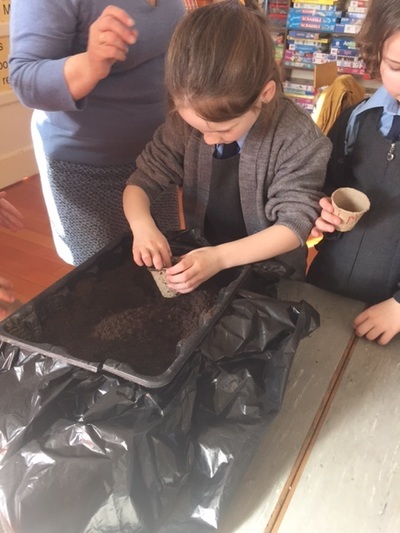 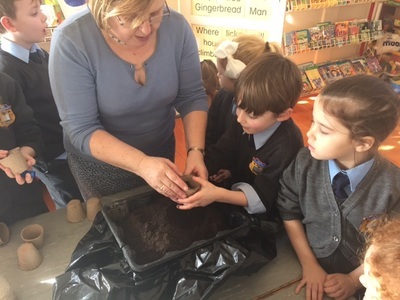 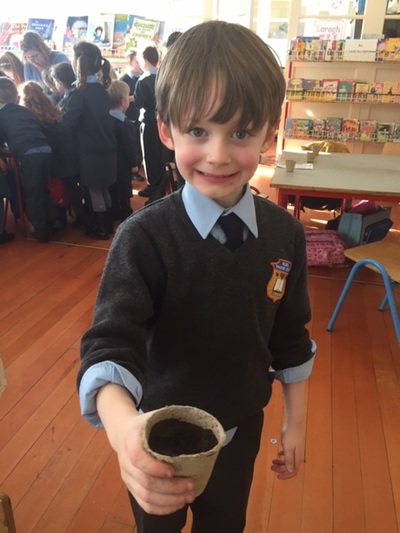 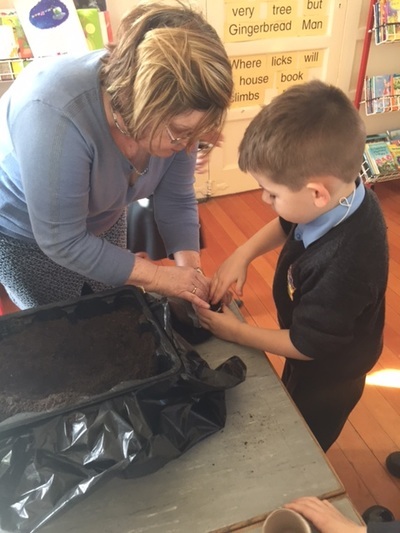 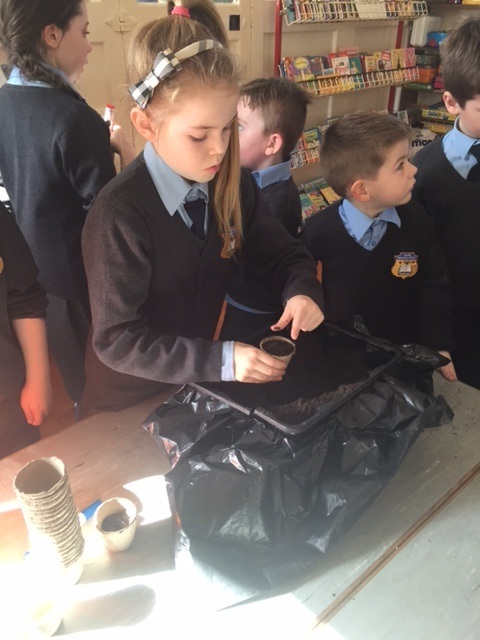 Spring was in the air as we embraced our 'green fingers' in the Junior Room this week with the help of Ms. Browne and Abigail and Ryan from the Senior Room. 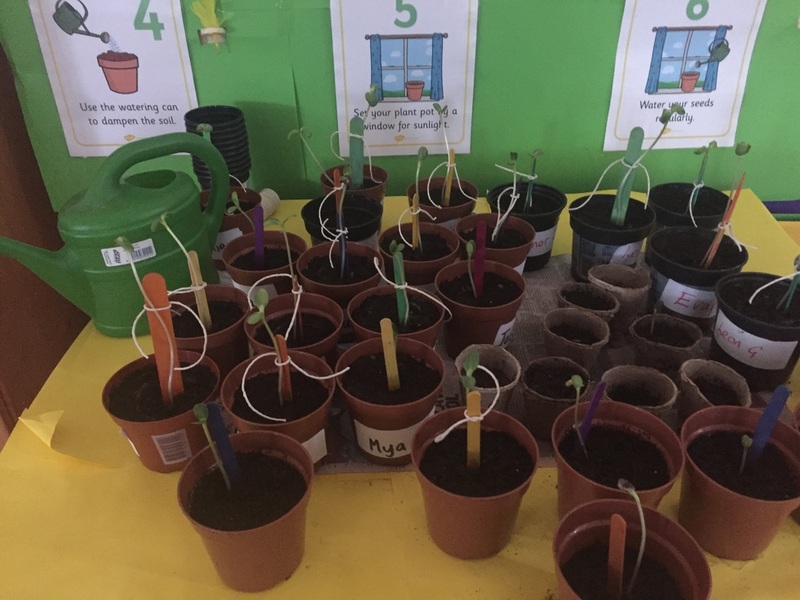 Each child has planted their own sunflower seed and we are going to see who can grow the tallest sunflower. 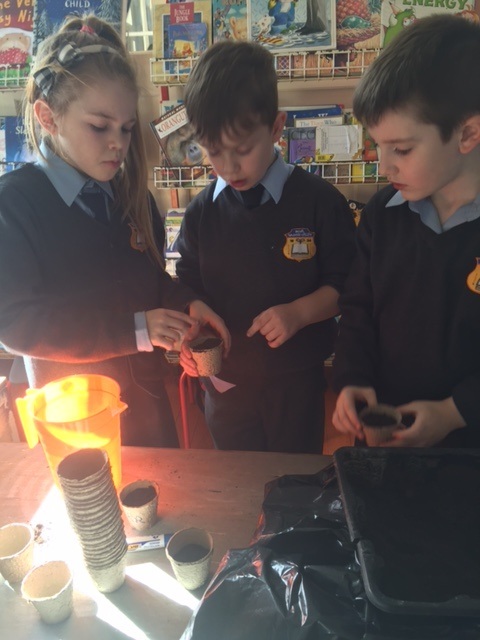 We planted our seeds in very small pots and will be transferring them to a larger pot at later stage. 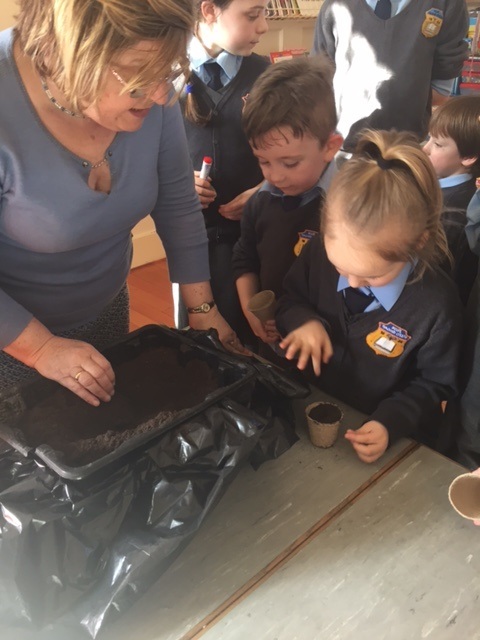 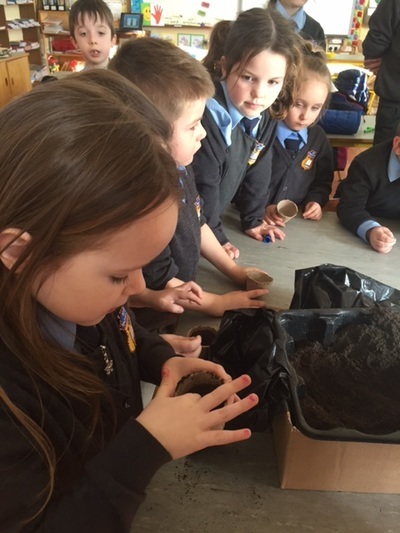 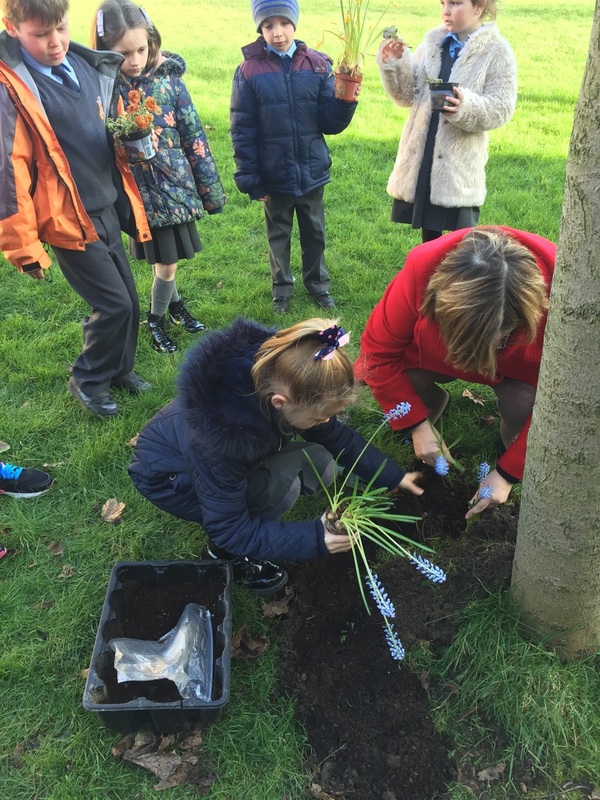 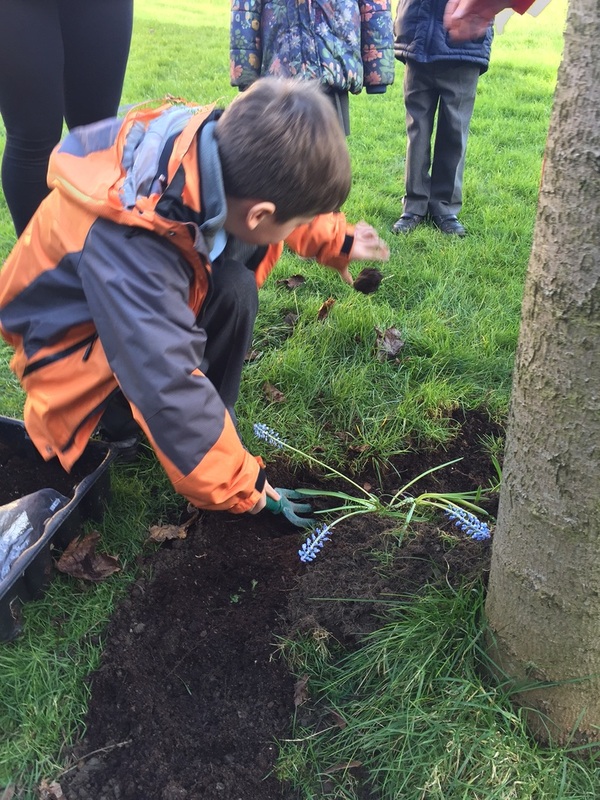 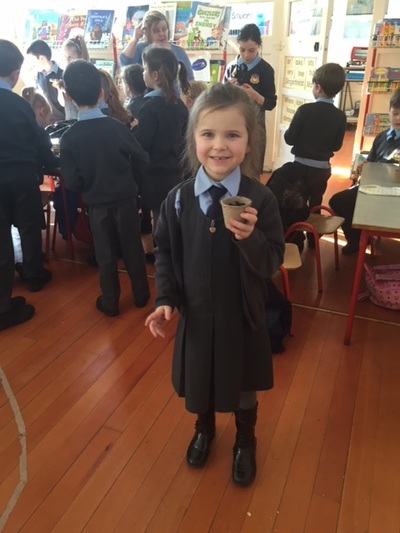 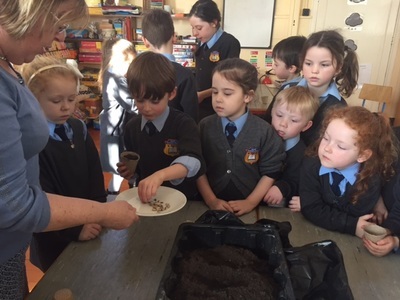 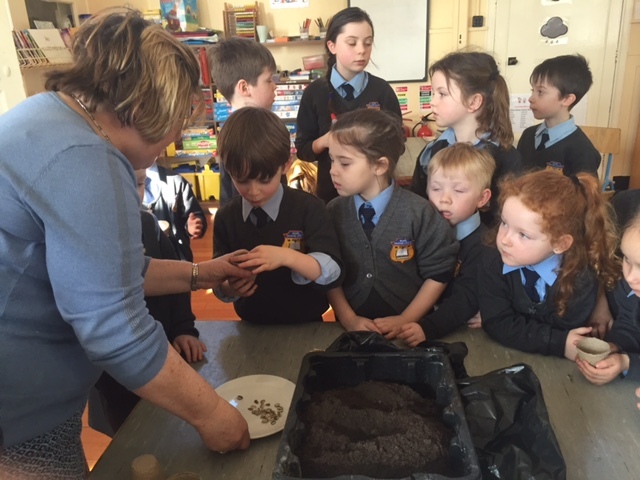 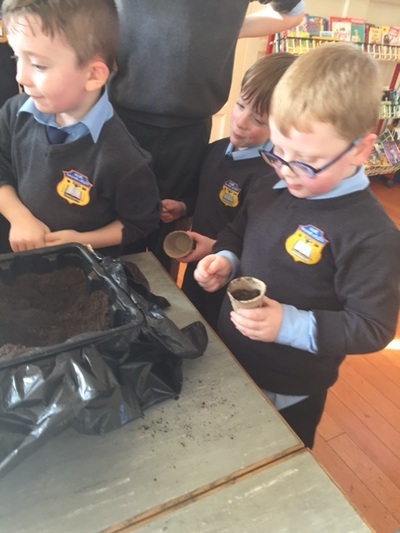 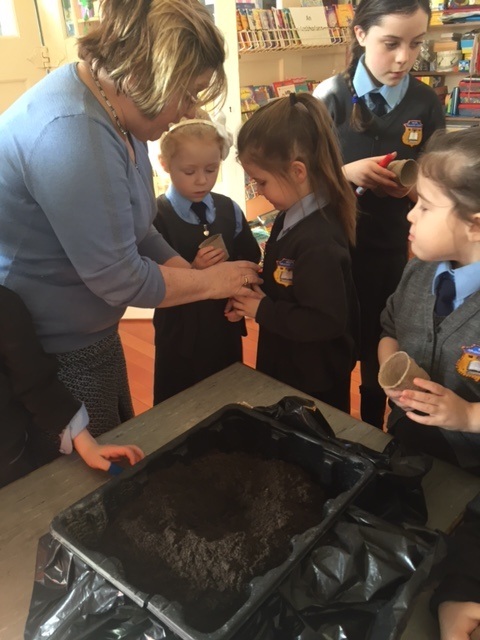 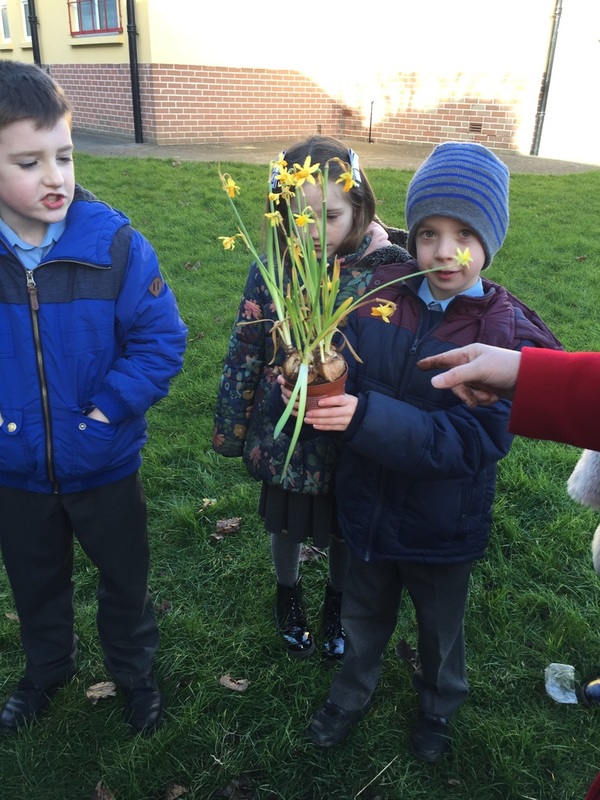 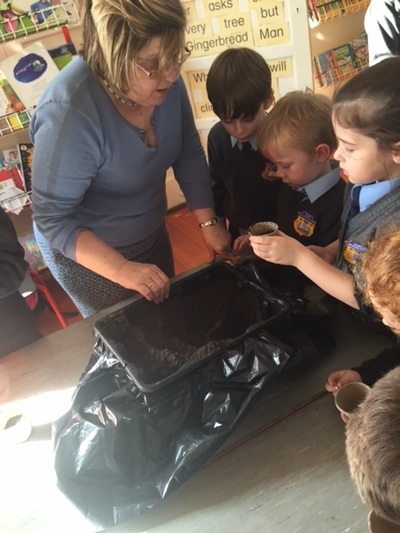 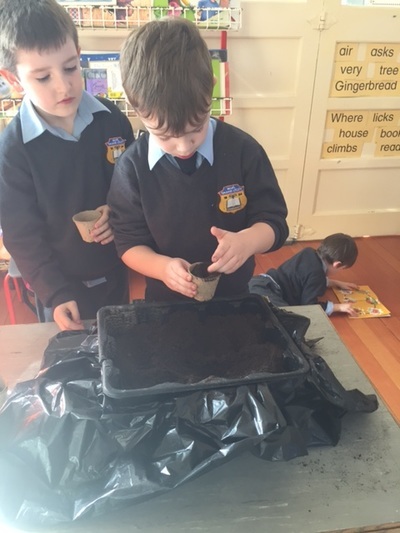 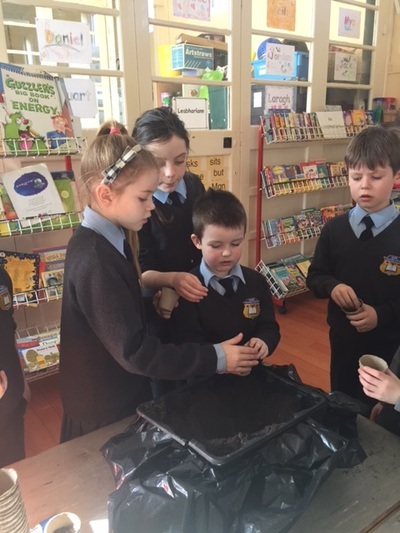 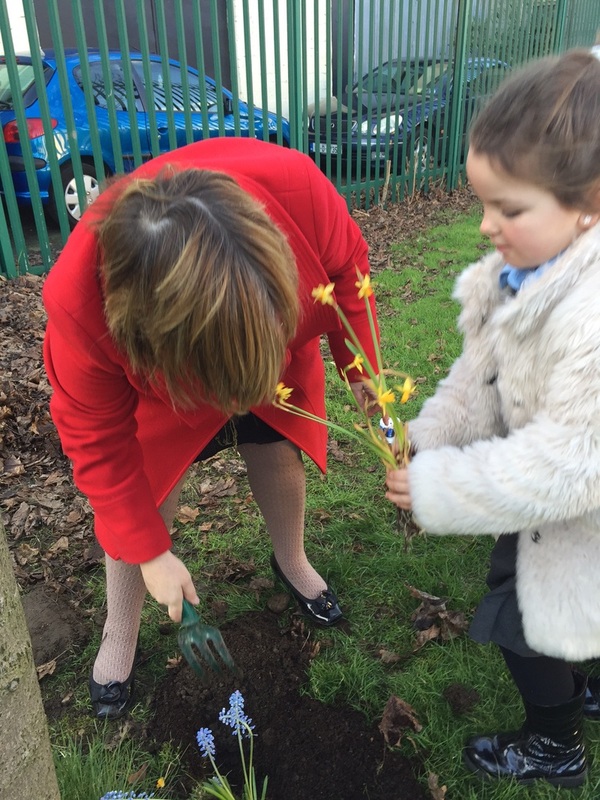 1st and 2nd Class did some outdoor planting with Ms. Browne. 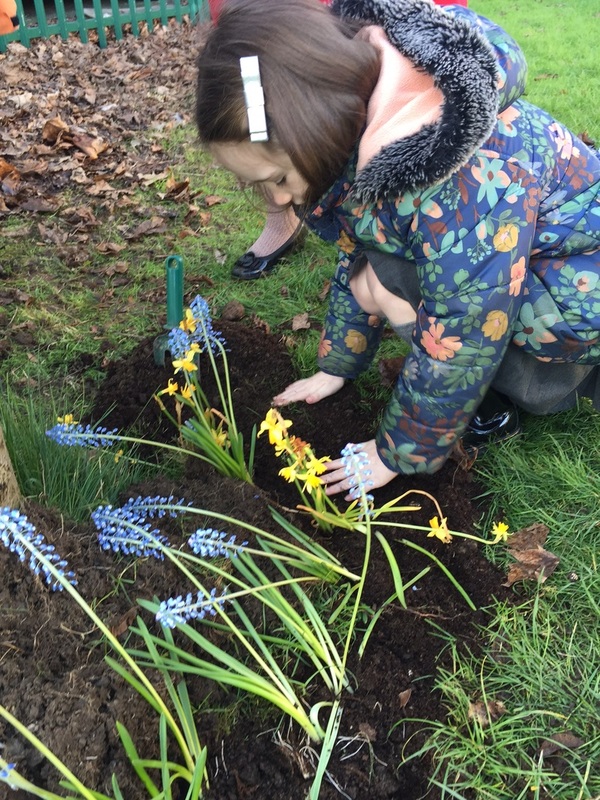 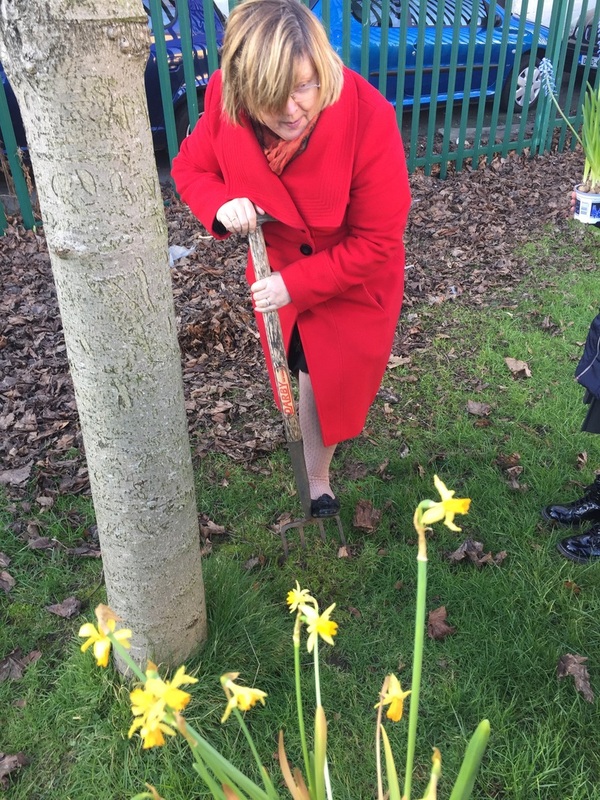 They planted miniature daffodils and hyacinths. They had been patiently waiting for two weeks for some dry weather to plant them. 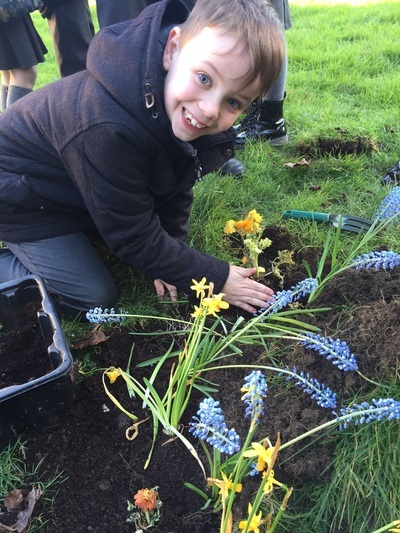 Although the plants are nearly finished flowering - What we'll be eagerly watching is what comes back next year!! 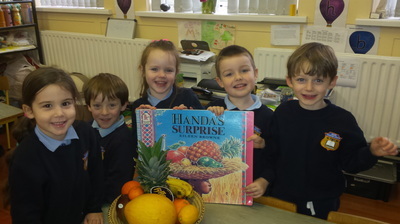 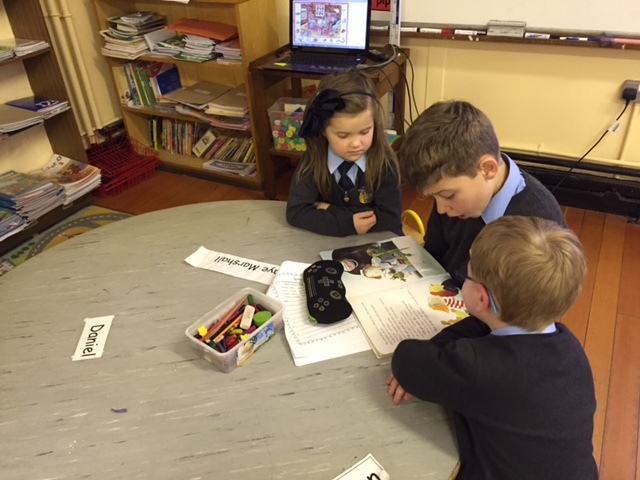 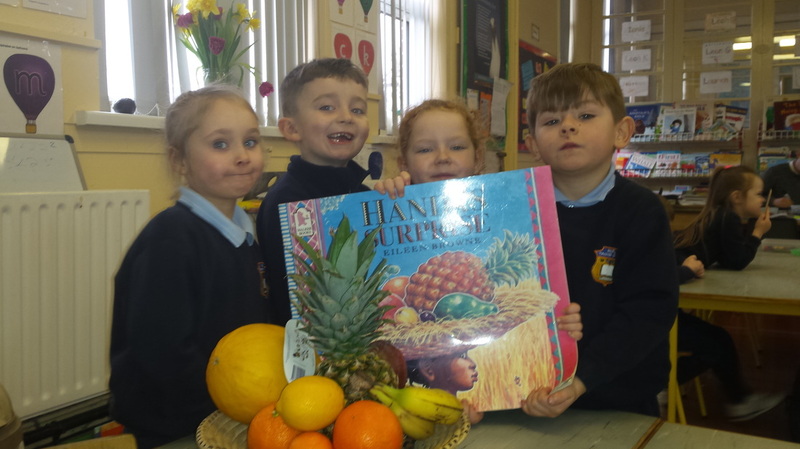 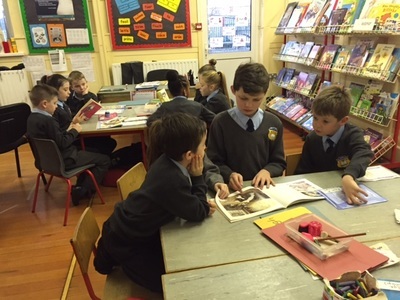 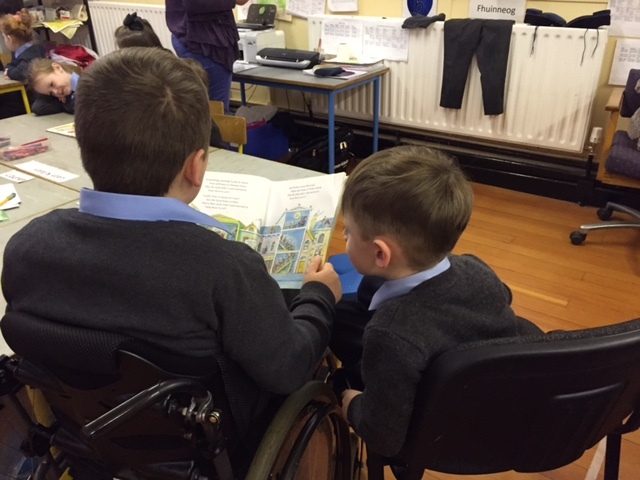 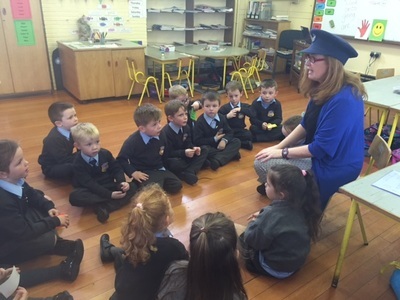 Junior Infants read Handa's Surprise with Ms Browne this week. 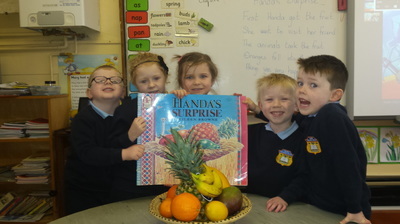 Handa's adventure through the jungle inspired Ms. Browne to bring along some exotic fruits for the Junior Room to look at and talk about. Handa's fruit got grabbed by the mischievous animals in the jungle...I wonder will the Juniors gobble up the delicious treats too! 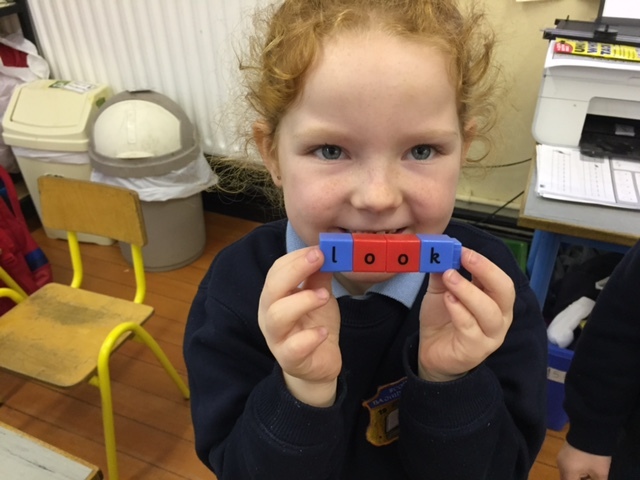 Check back in to find out! 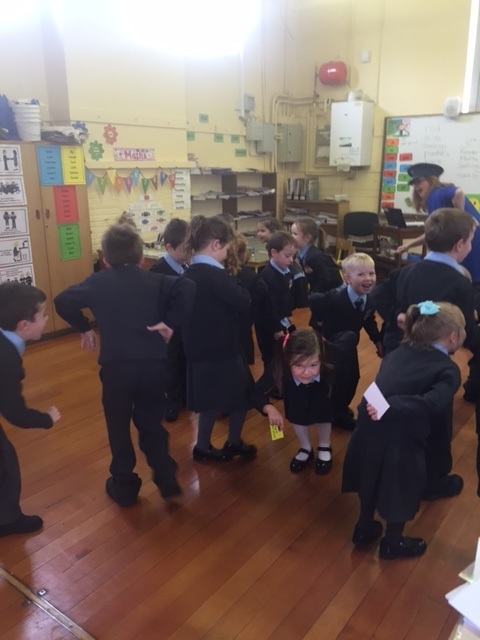 Juggling fun with Alicia and the children of Juniors, Seniors, 1st and 2nd Class. 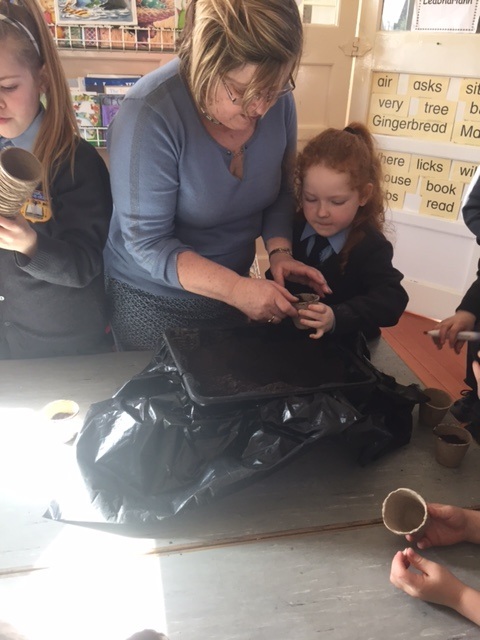 Many thanks to Alicia for all her help and inspiring ideas while she was with us last week. 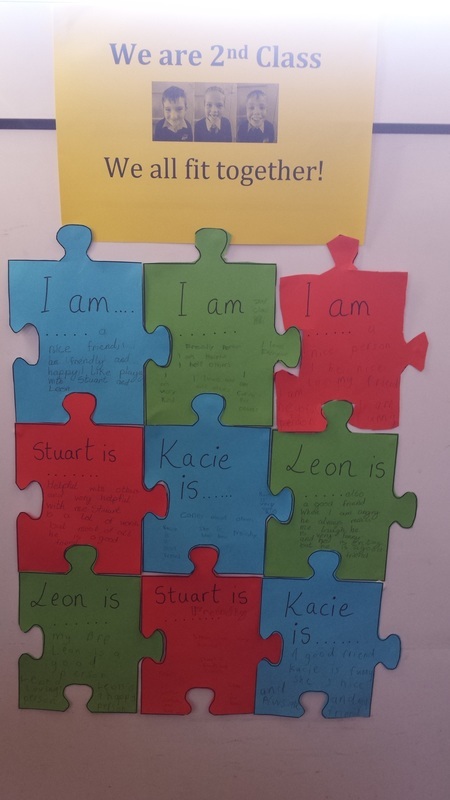 Like pieces of a puzzle, 2nd Class just fit together. What wonderful compliments can be seen in the Junior Room at the moment. 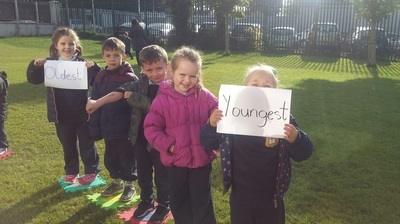 Kacie, Leon and Stuart have made a wonderful display where they wrote a list of the things that are good about themselves and then their classmates wrote one too. 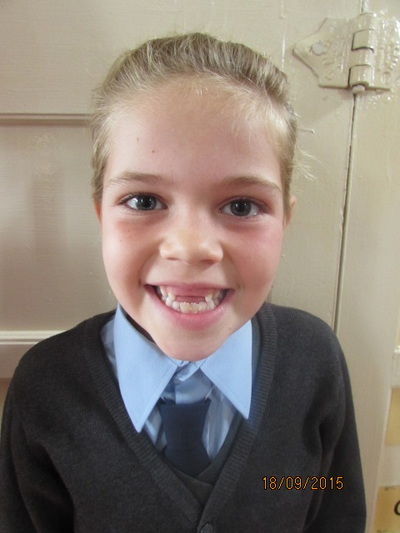 Friendship was the overwhelming theme which is so wonderful to see in our Communion group. 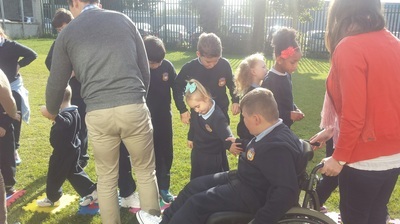 Welcome back everyone and a very special welcome to our new children Conor, Daniel, Evan, Harrison, Jamie, Leah, Lauren, Leila and Saoirse! 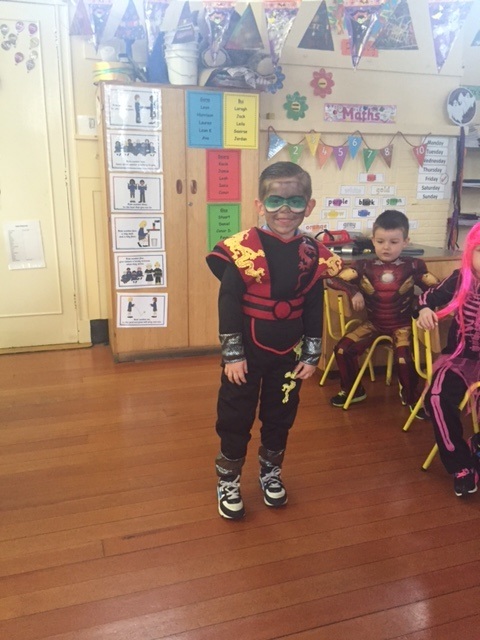 We are looking forward to an action packed fun filled year!!!! 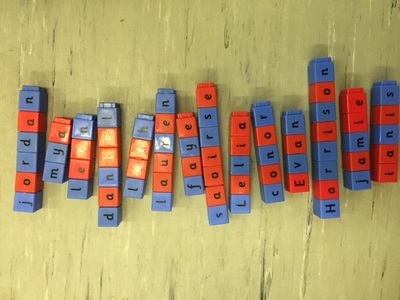 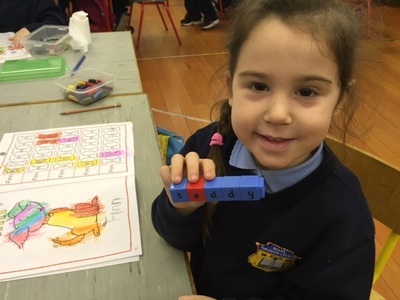 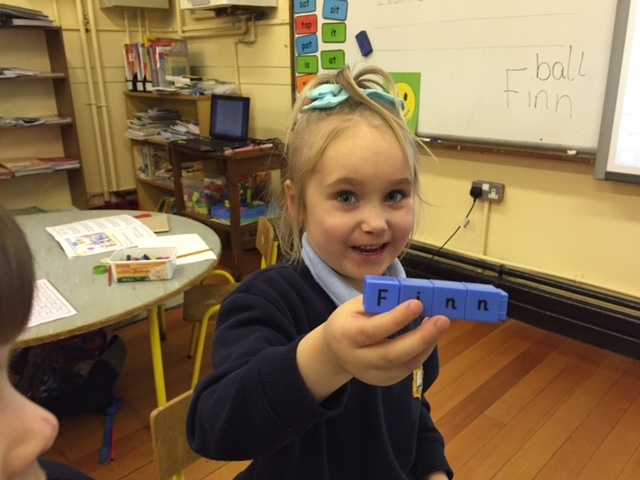 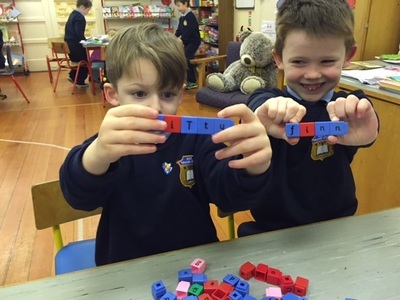 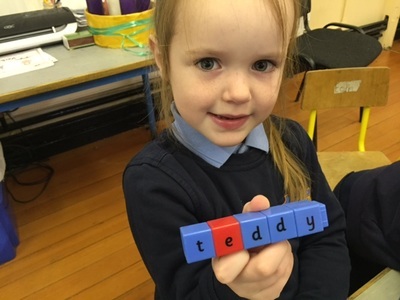 The Junior Infants have been busy making their words from the reader which they started last week. 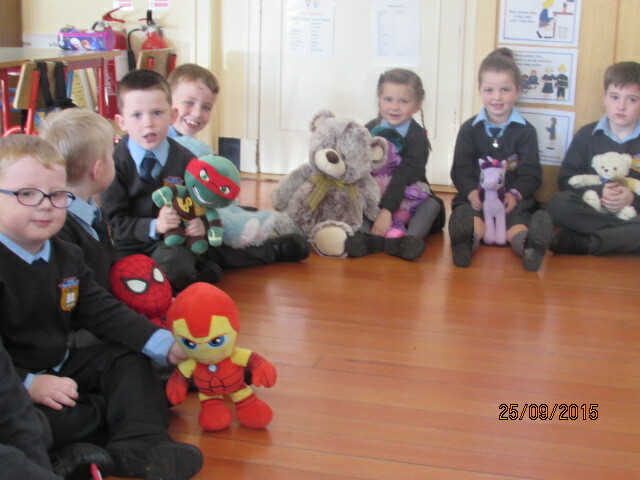 So far we have met Kitty, Finn and Teddy and we are looking forward to see what mischief they get up to!!! 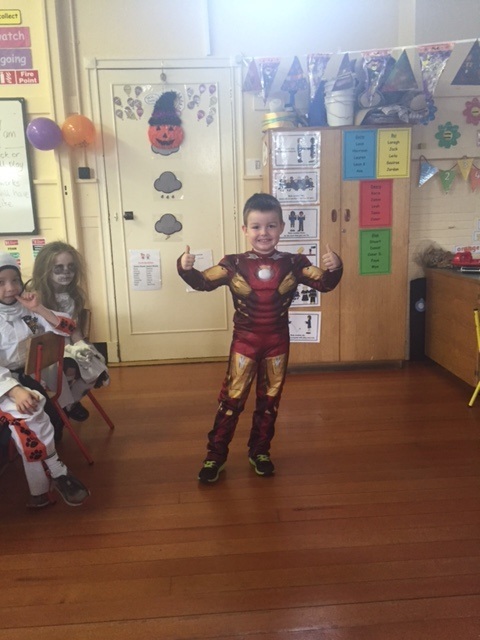 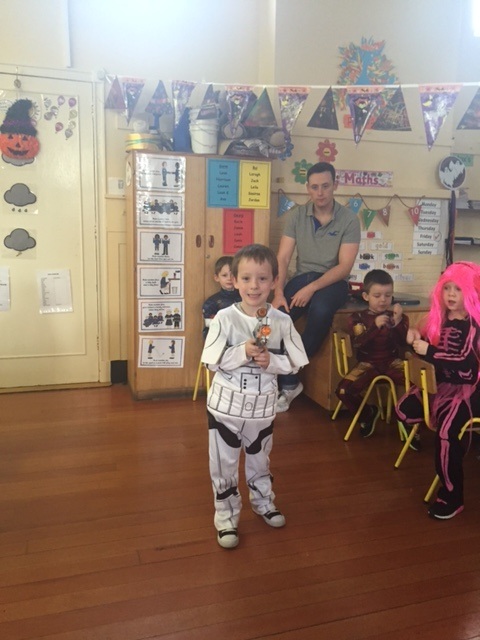 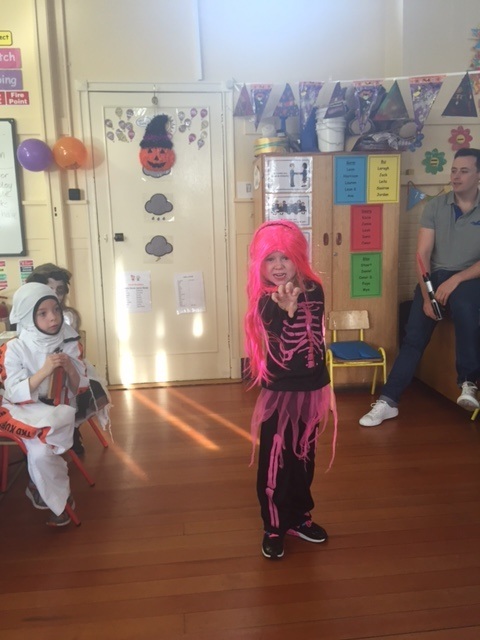 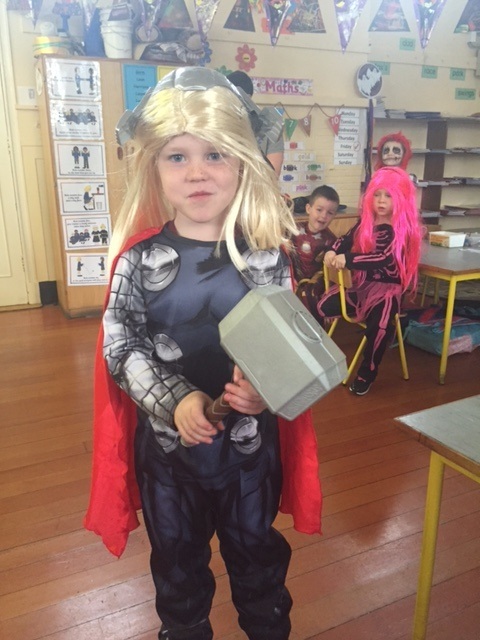 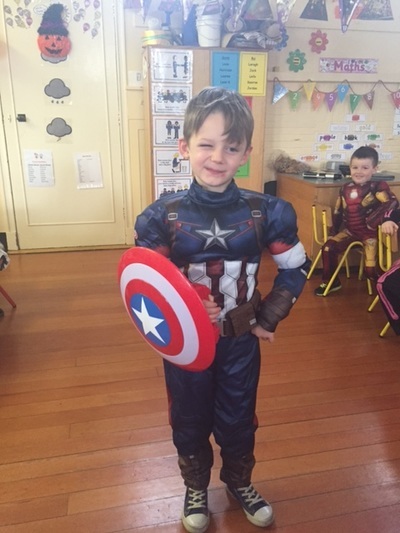 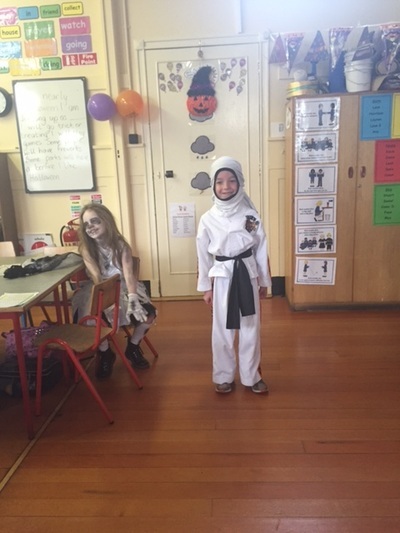 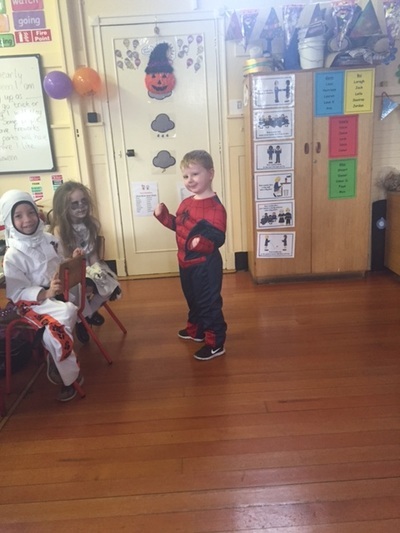 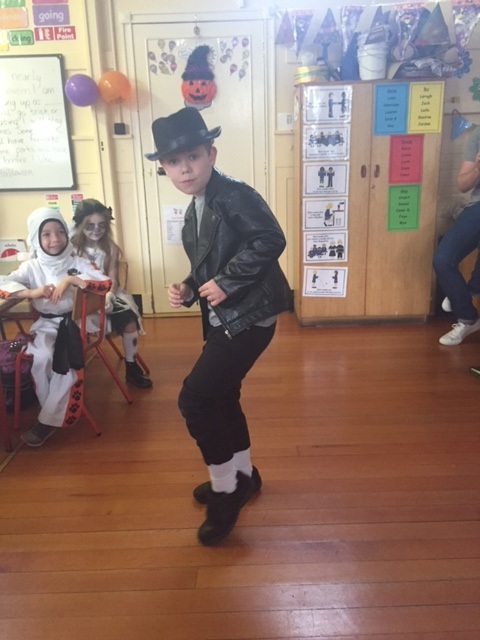 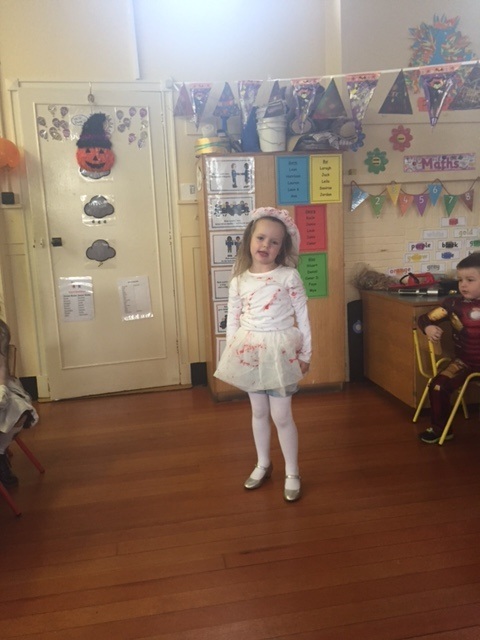 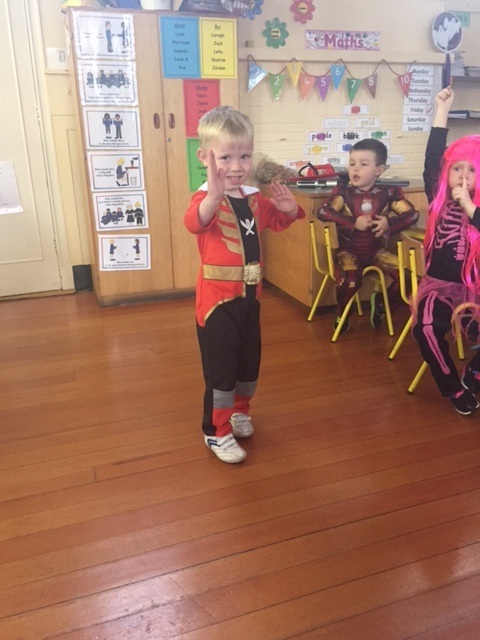 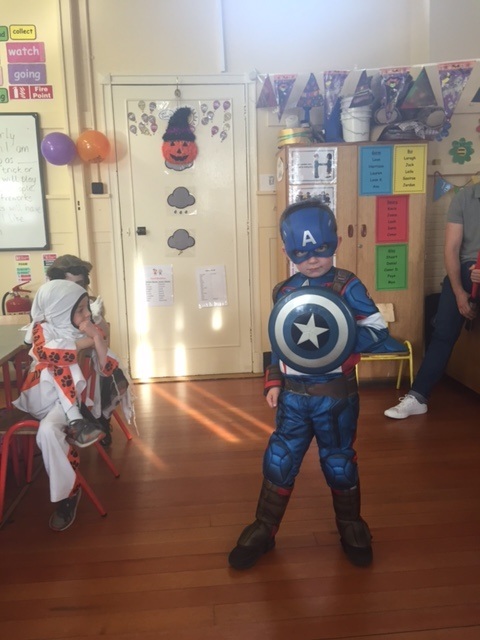 Well done to all the boys and girls who dressed up for Halloween. 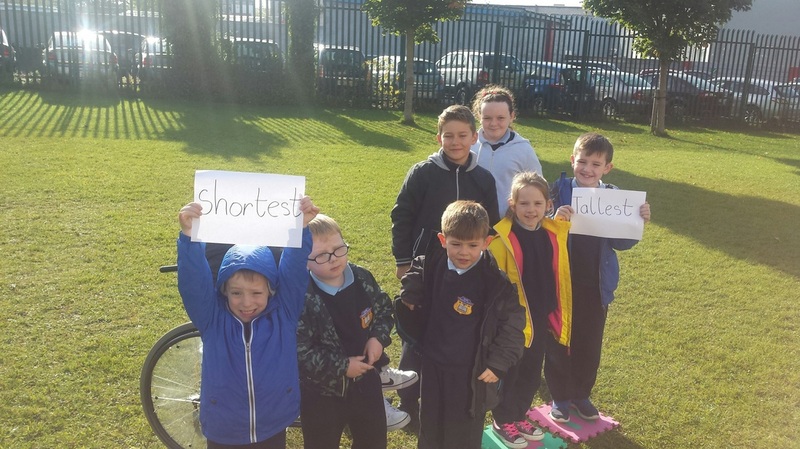 A great effort was made by all! 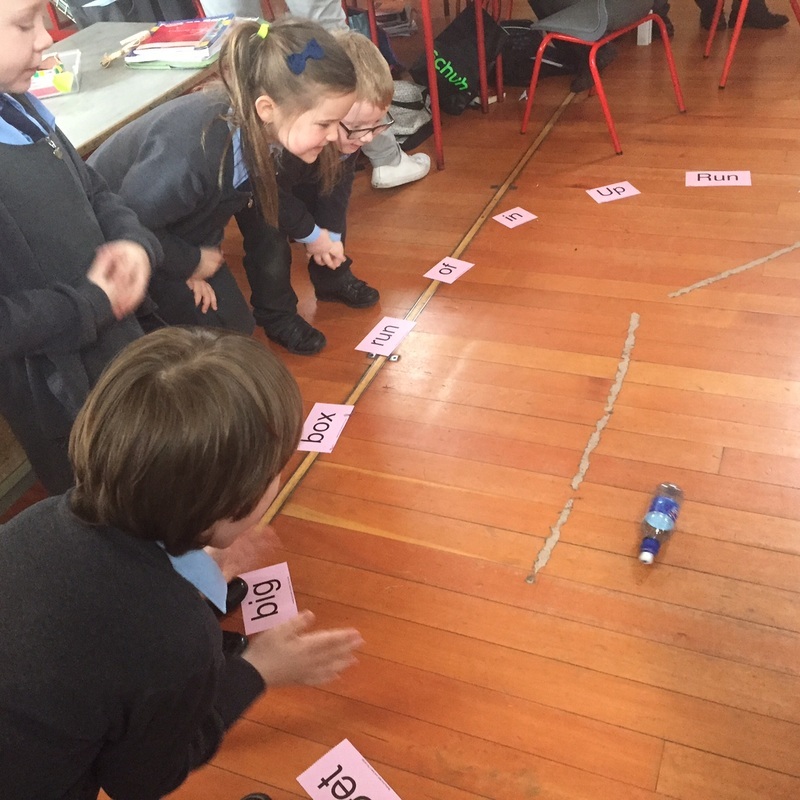 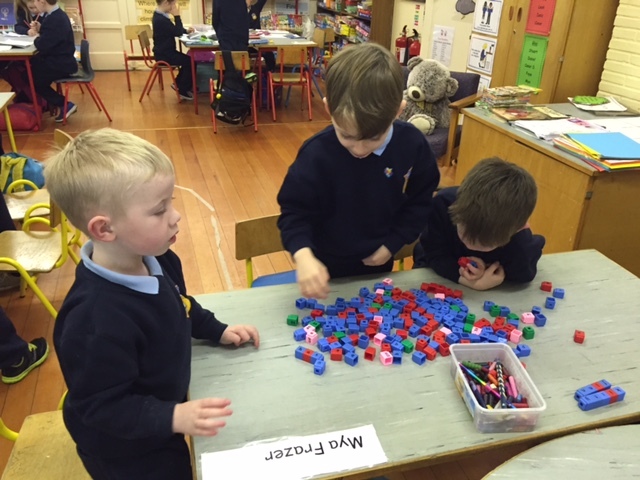 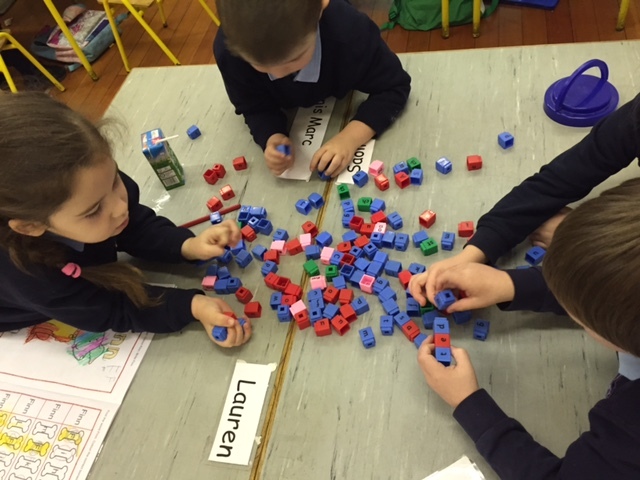 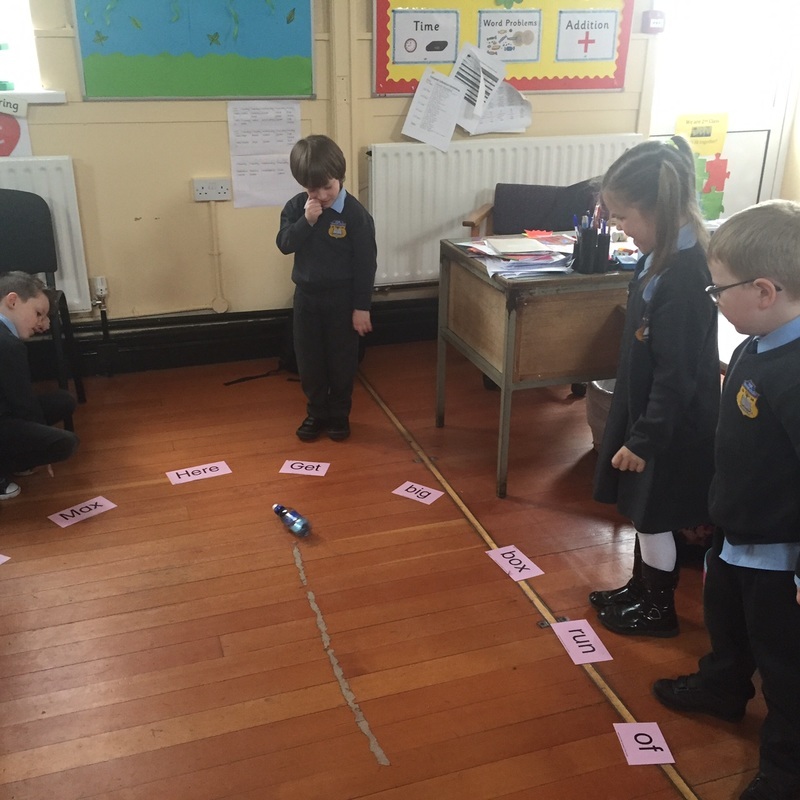 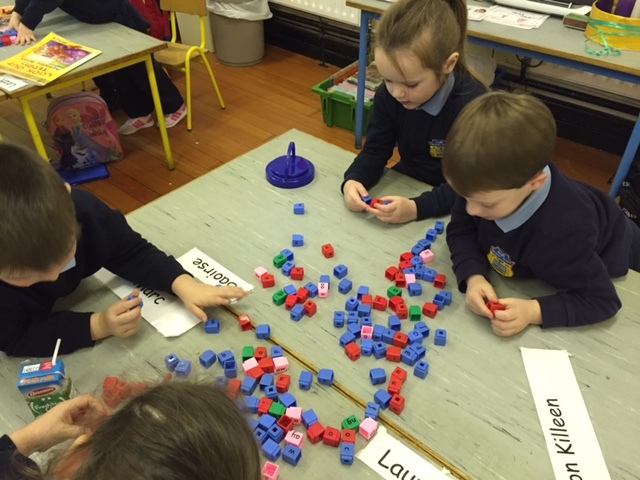 The Junior Room enjoyed a very busy Maths Week. 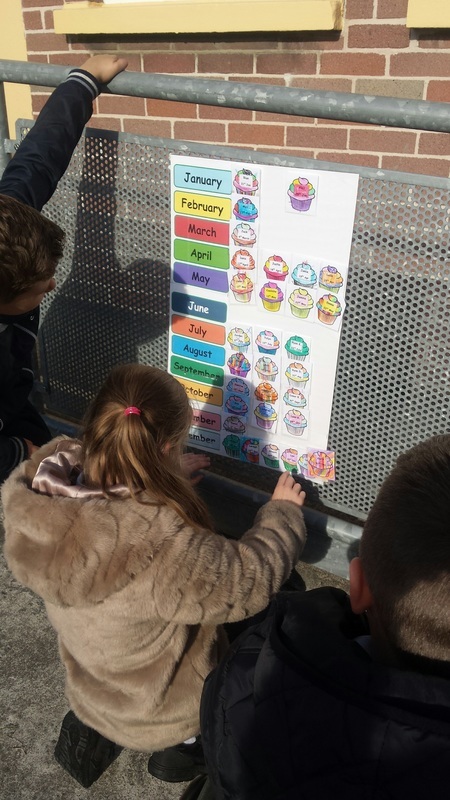 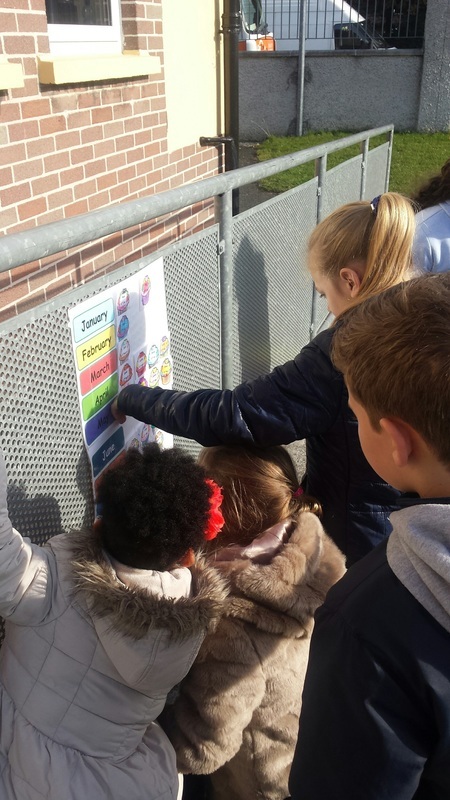 The Senior played maths games with us, We went on a Maths Trail and we had a competition to guess 'How many sweets were in the jar' . We also did a sorting activity with the help of the Senior Room. 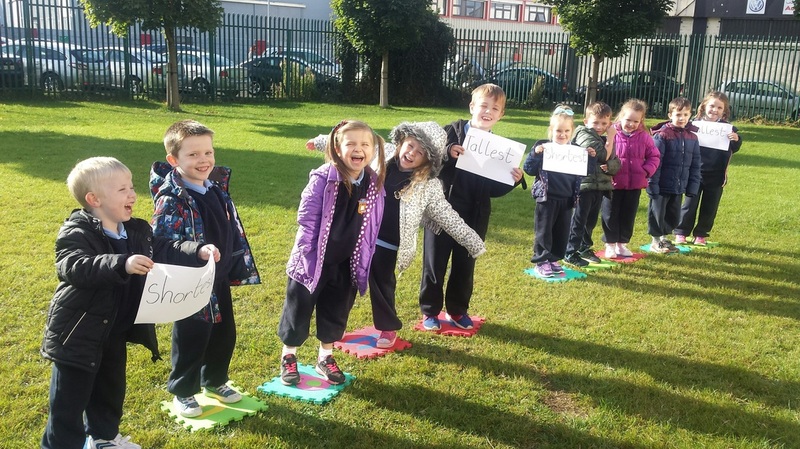 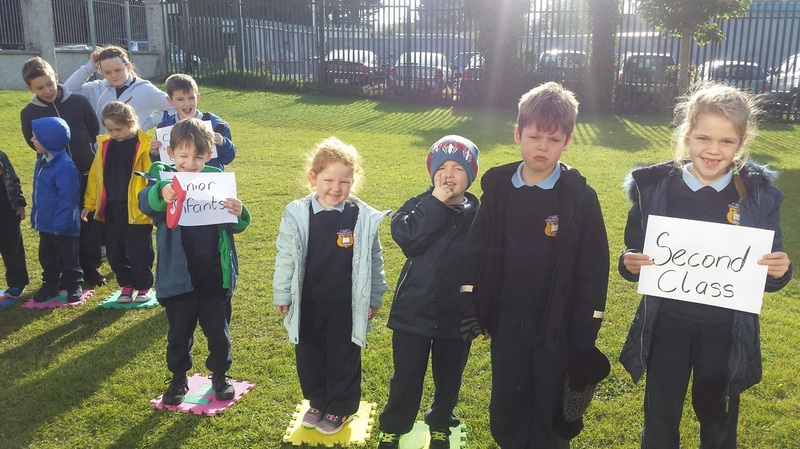 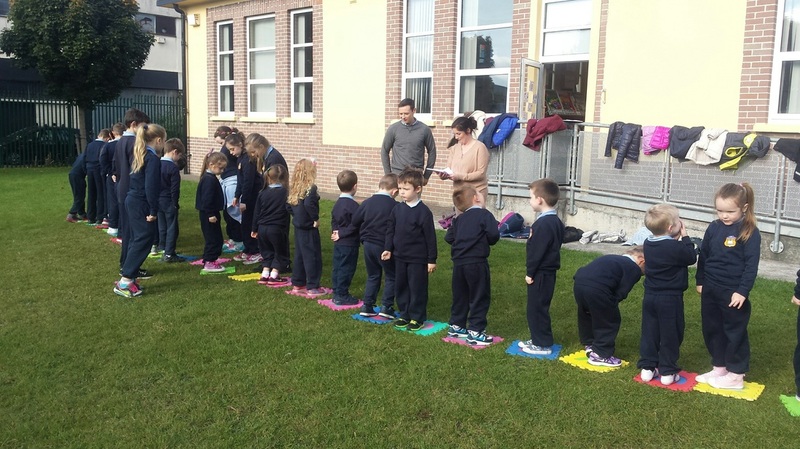 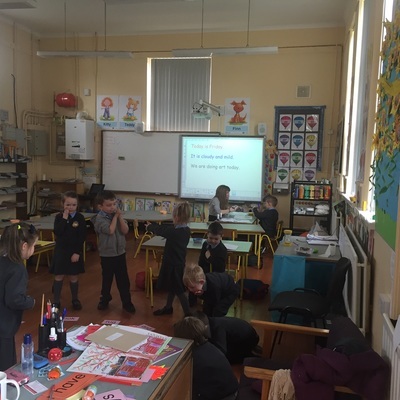 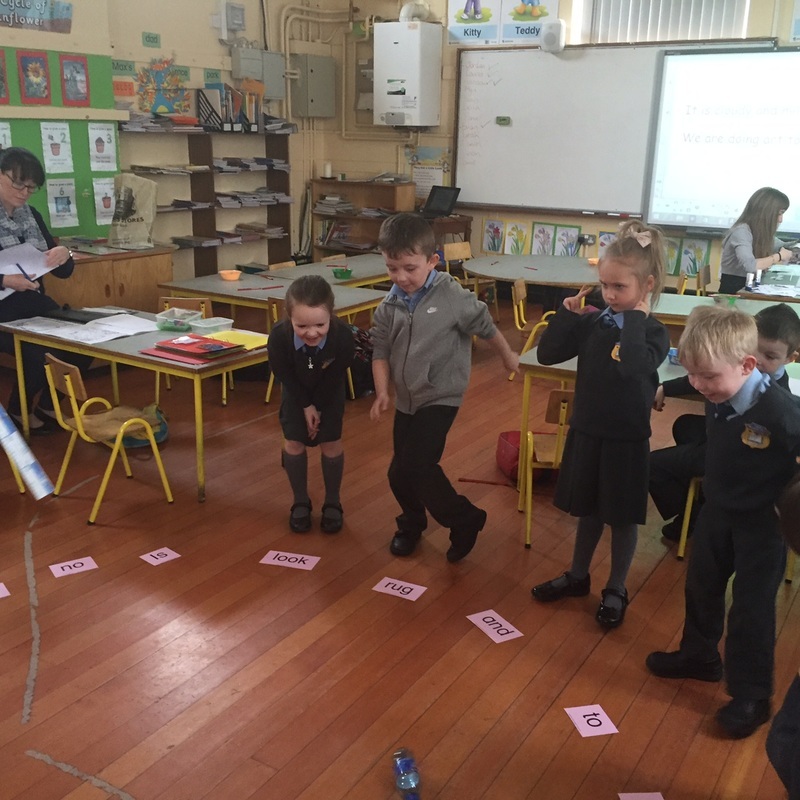 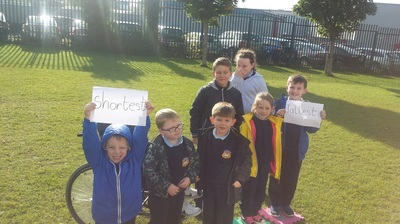 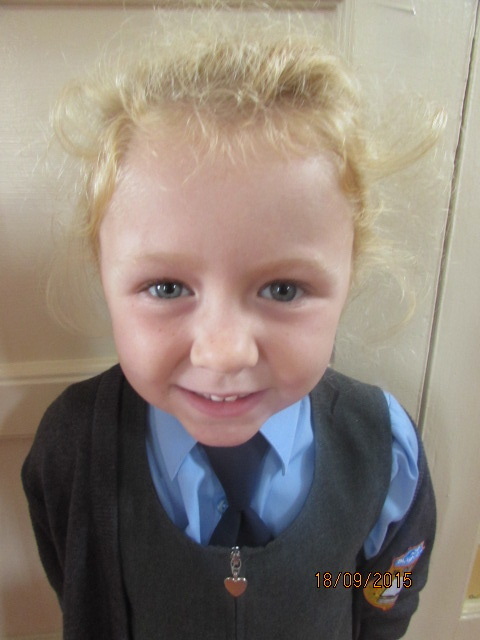 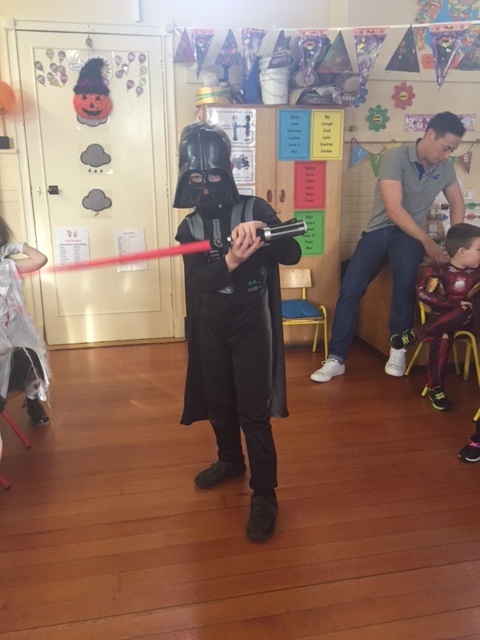 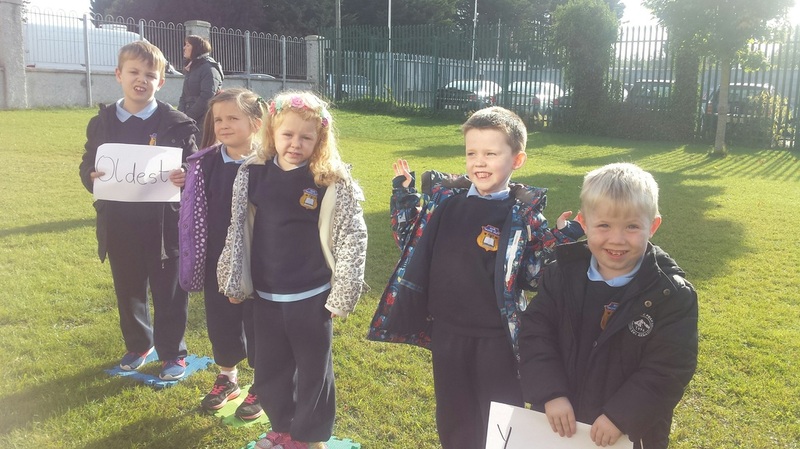 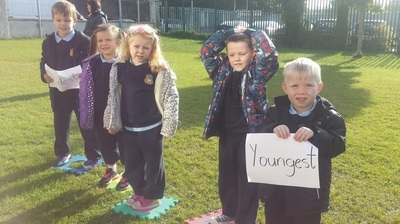 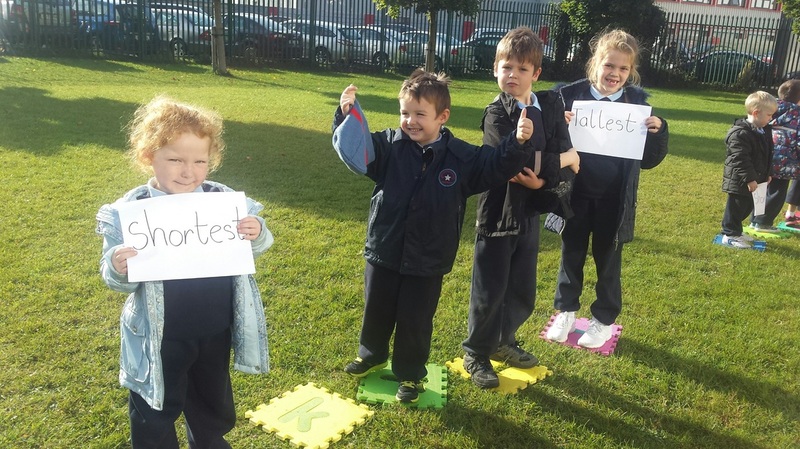 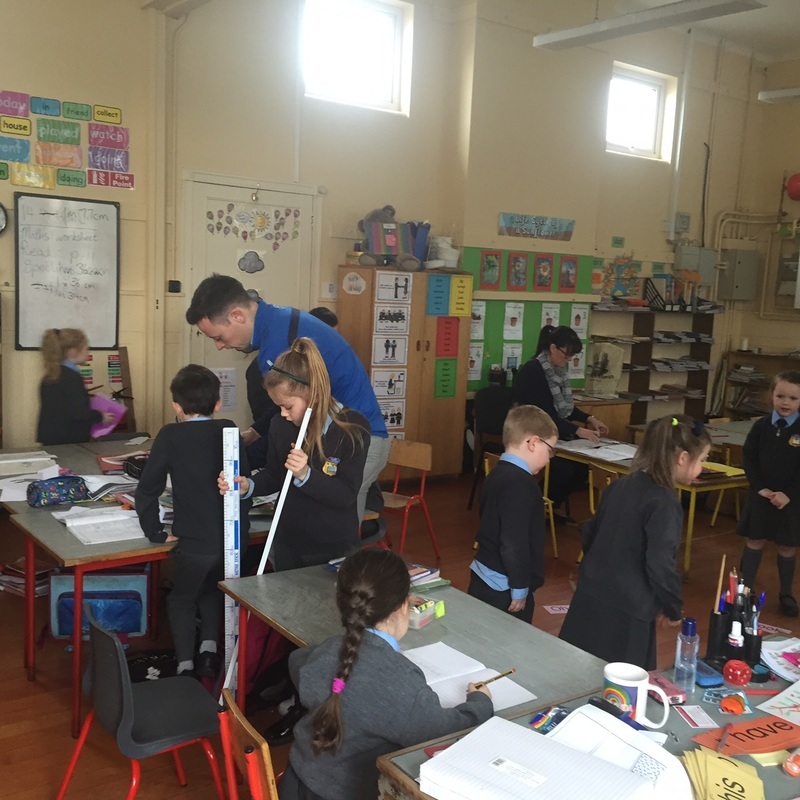 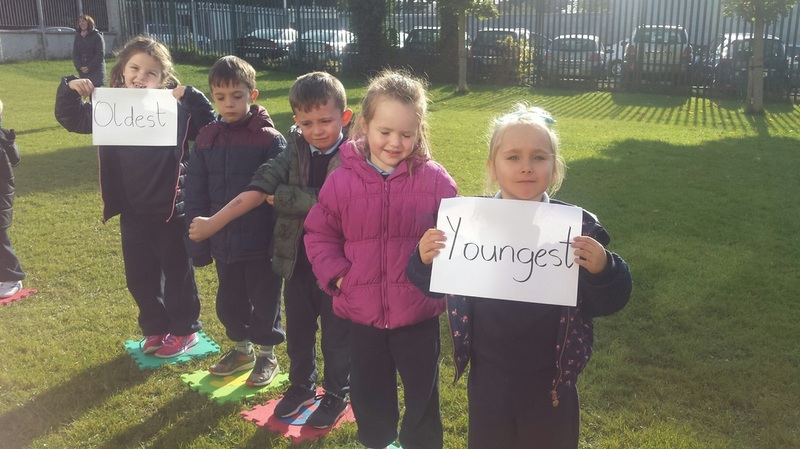 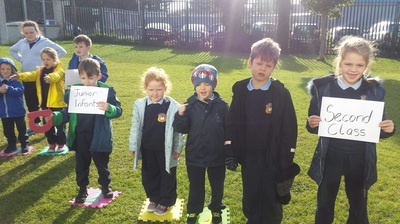 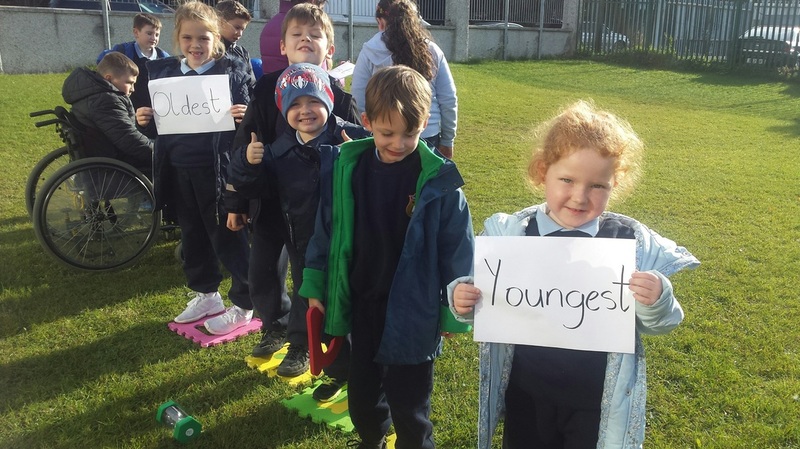 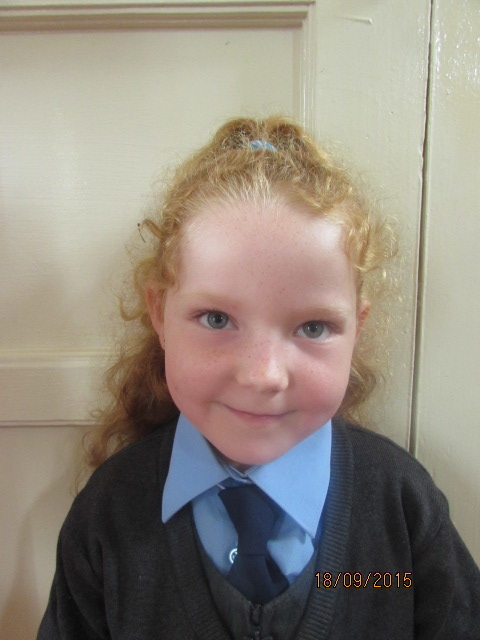 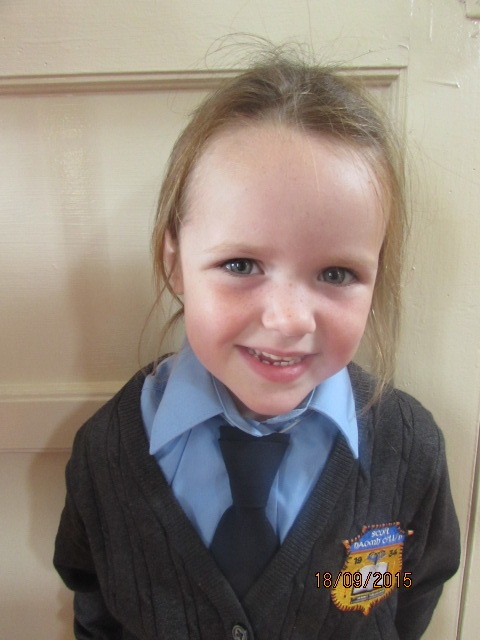 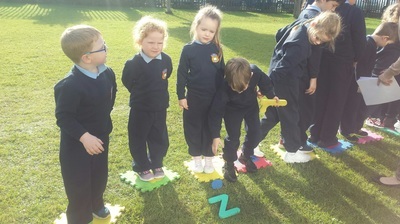 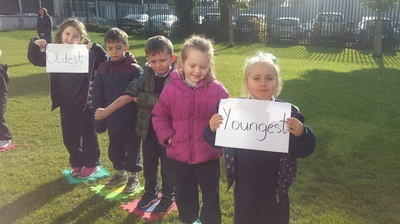 In group we organized ourselves from shortest to tallest, youngest to oldest and also Junior Infants to Second Class. We are busy being detectives in Drama at the moment. 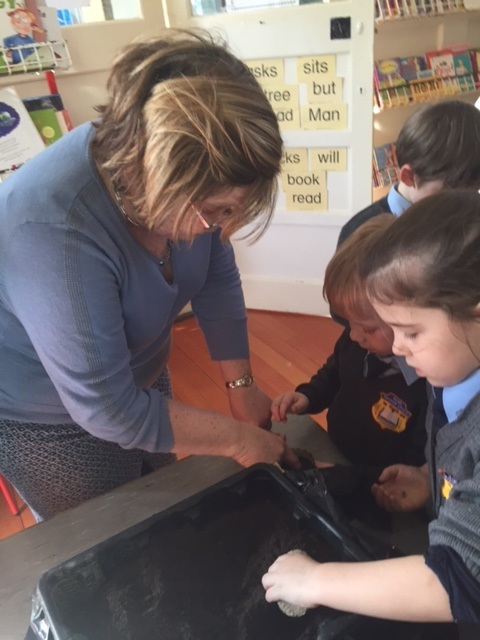 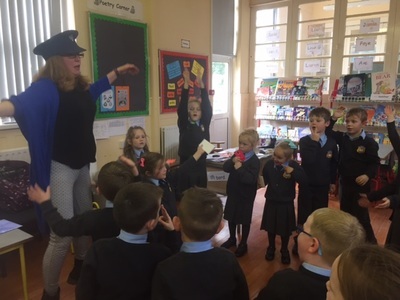 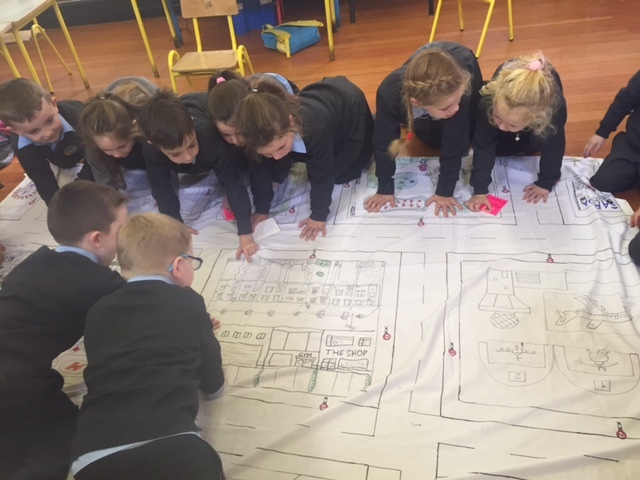 We are helping Janine, our Drama teacher to solve to mystery of who broke into Mr. Ó Breagáín's toy shop. We are all in the Gardaí being led by Detective O' Casey! We read This Is The Bear. It's a story about a bear called Fred who accidently goes on an adventure to the rubbish dump. 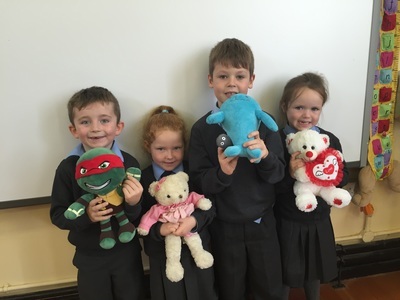 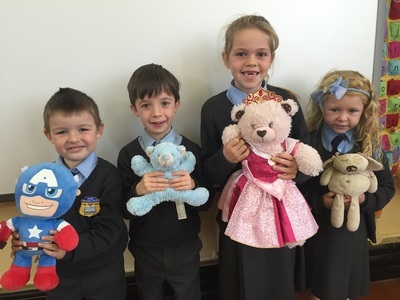 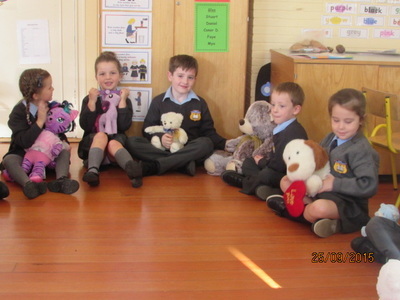 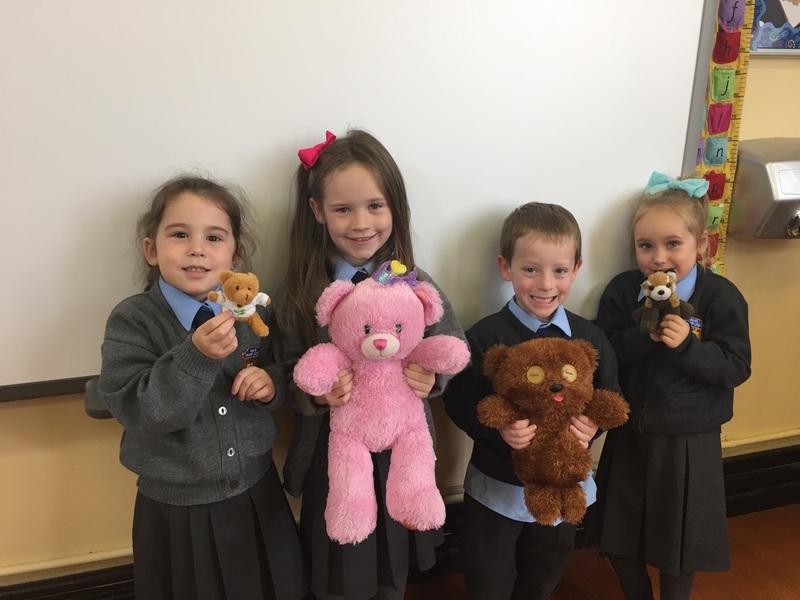 The boys and girls brought in their own teddy bears and on Friday we had a very special delivery. 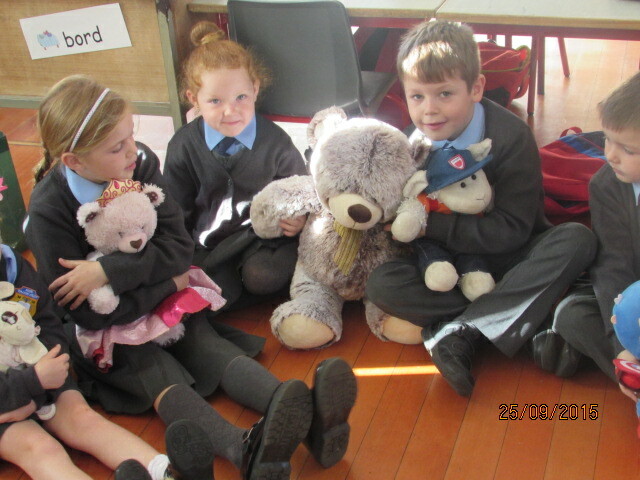 The Postman delivered a bear who is also called Fred. Fred has decided to join the Junior Room. 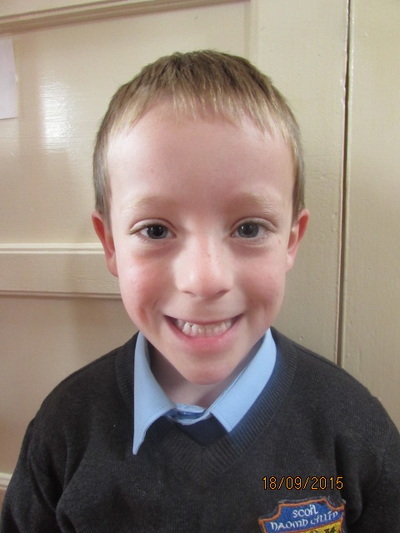 He will stay in school during the week and then at weekends he will stay with a child from the classroom. 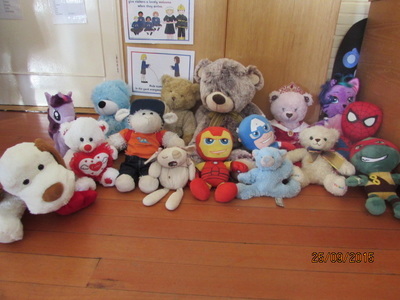 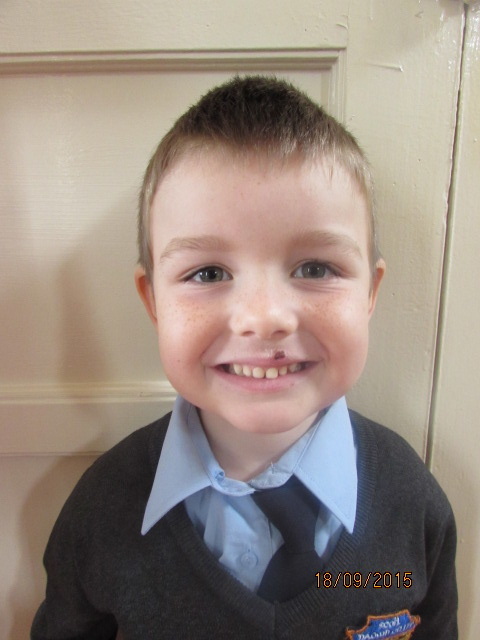 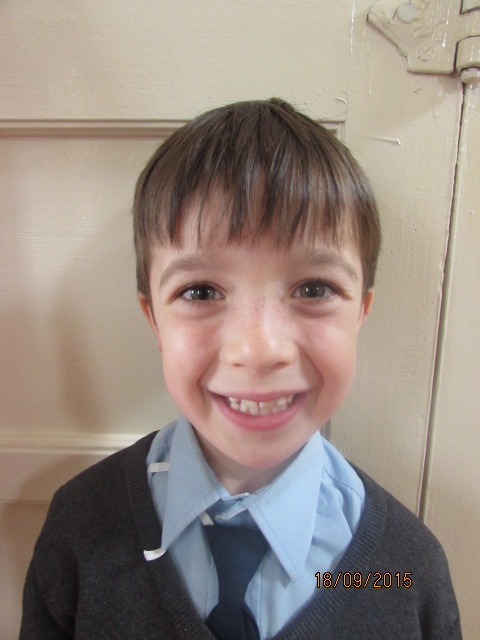 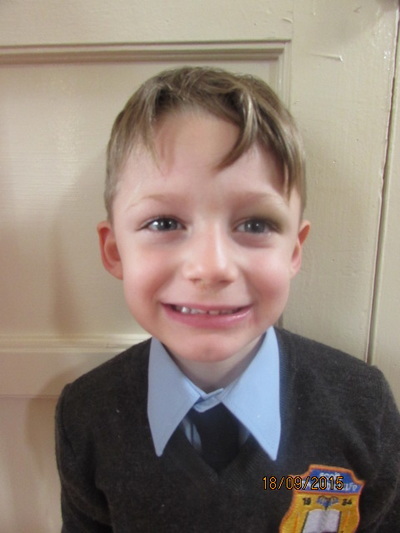 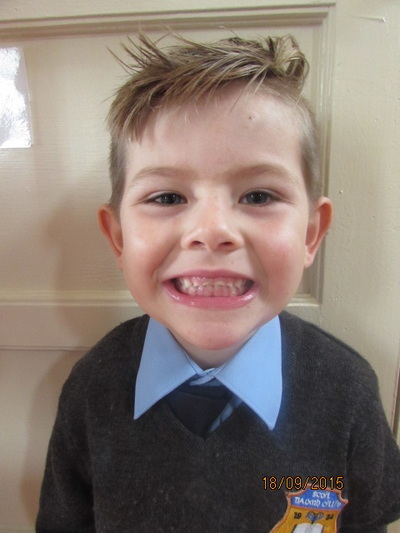 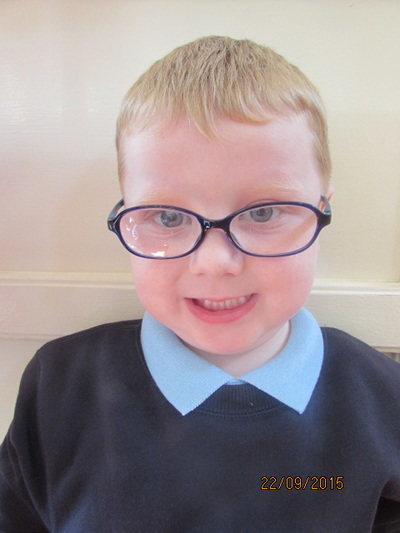 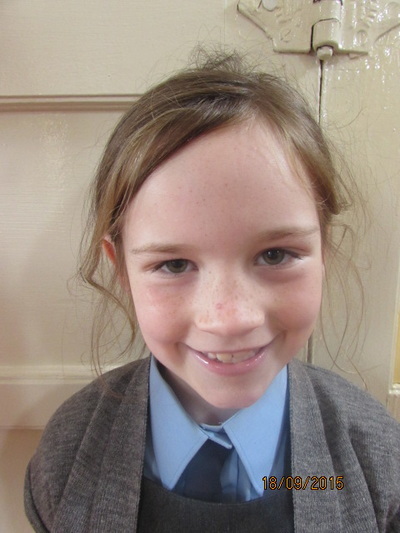 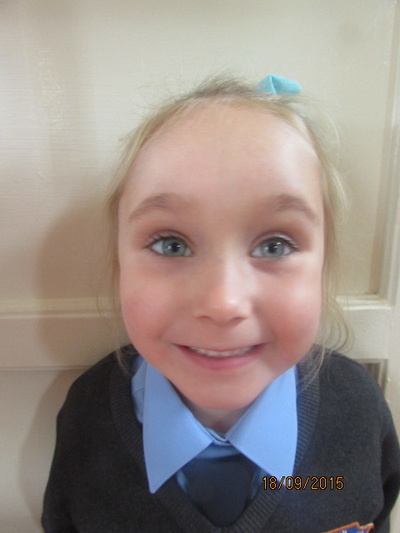 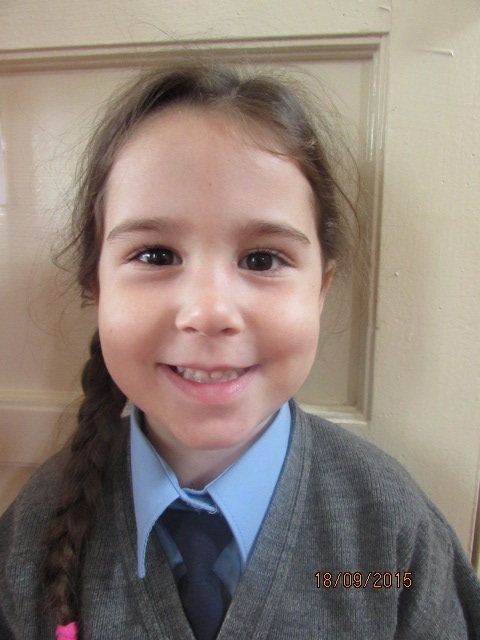 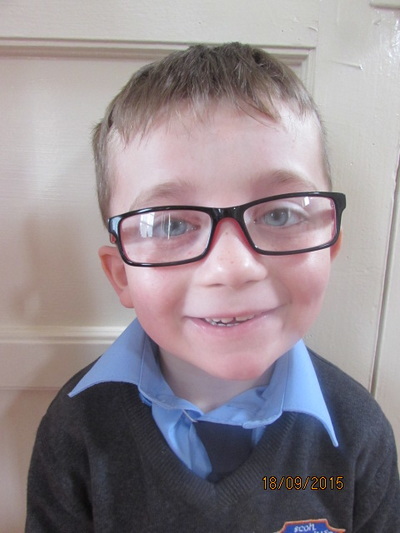 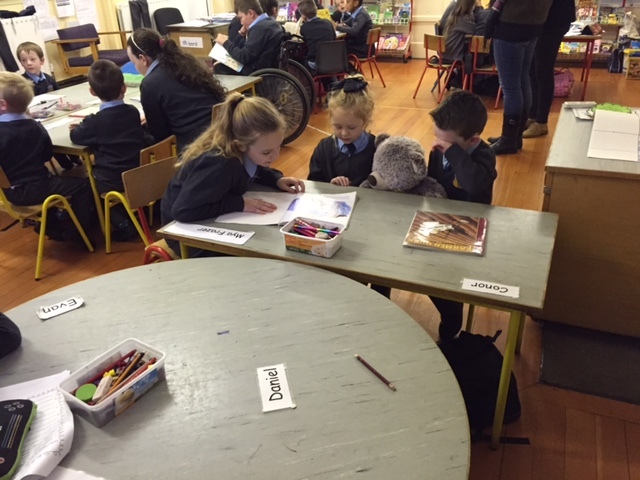 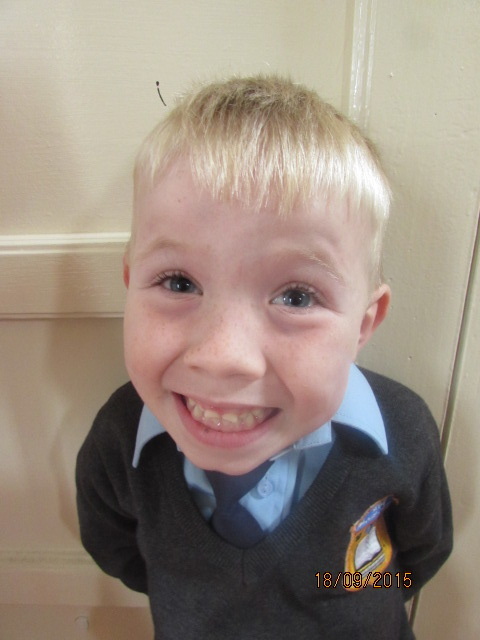 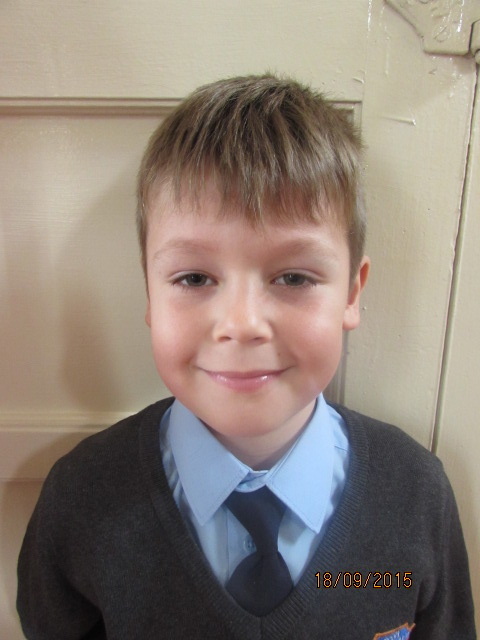 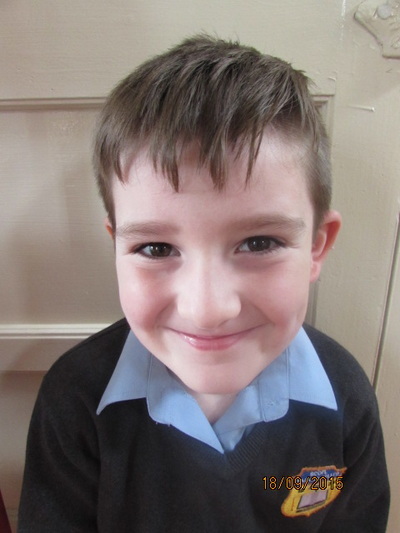 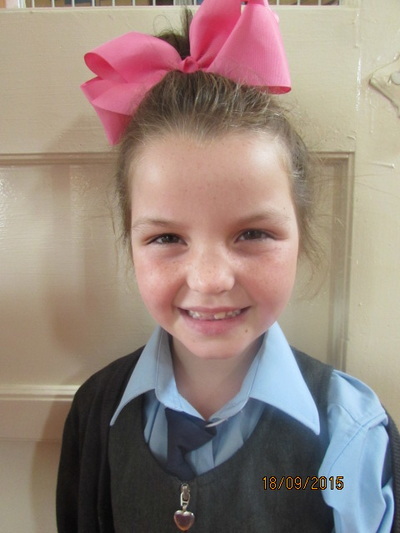 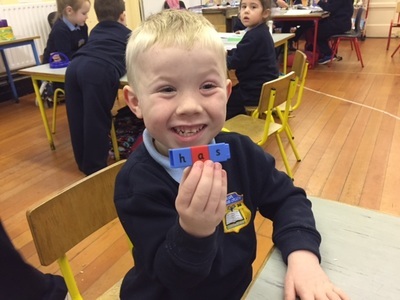 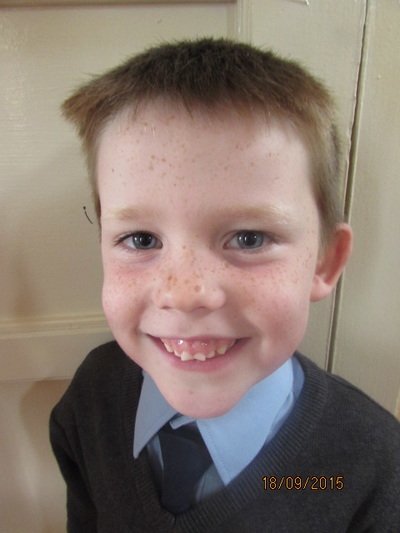 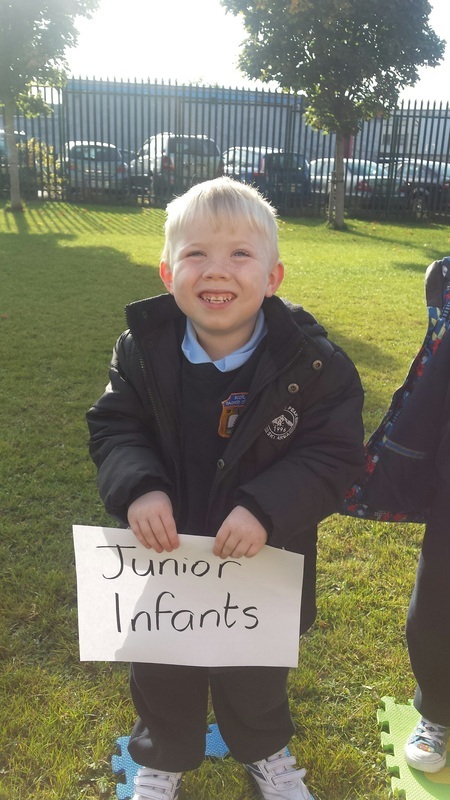 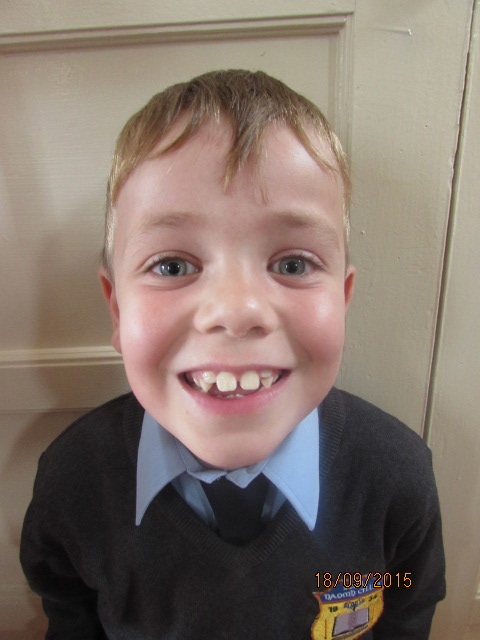 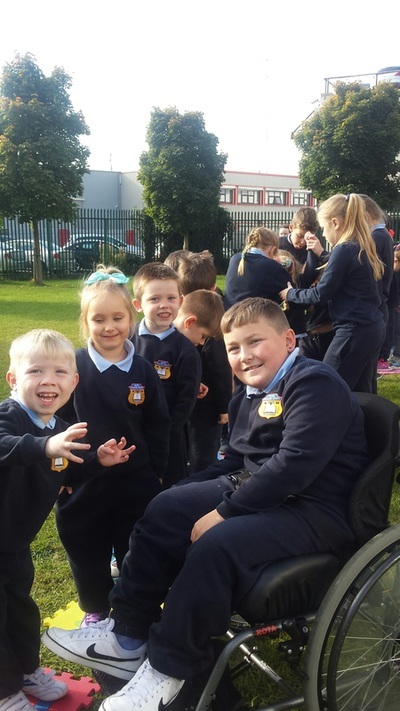 Fred has his own Blog to document his memories with the children from the Junior Room in St. Cillian's N.S. 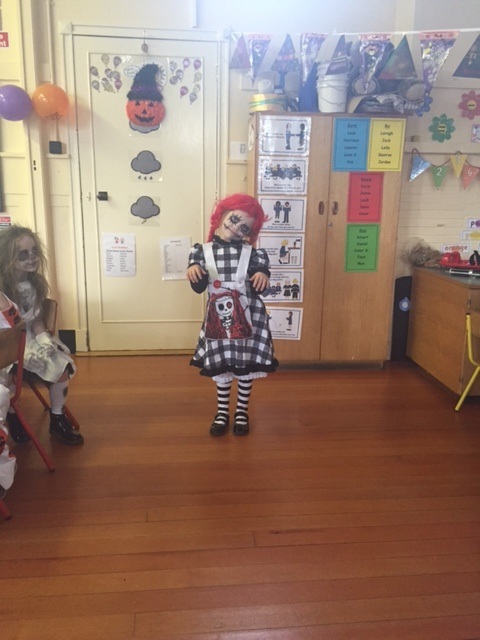 There is a distinct feeling of Autumn in the air in the Junior Room. 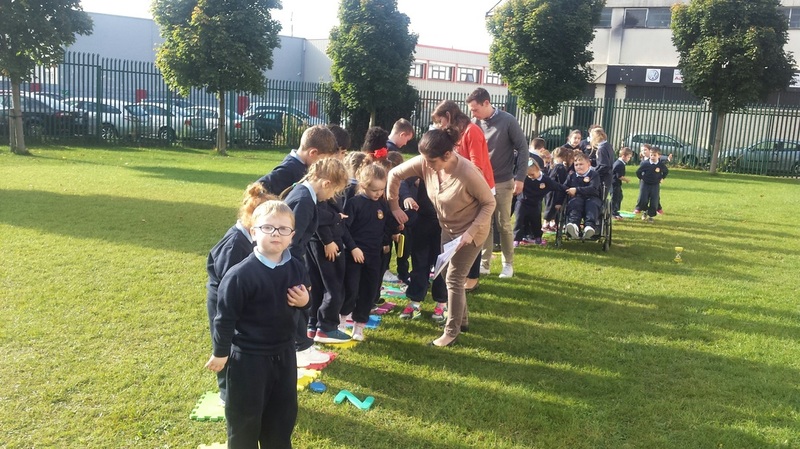 For our 1st Art lesson we created our class tree followed by autumn trees created with our handprints! 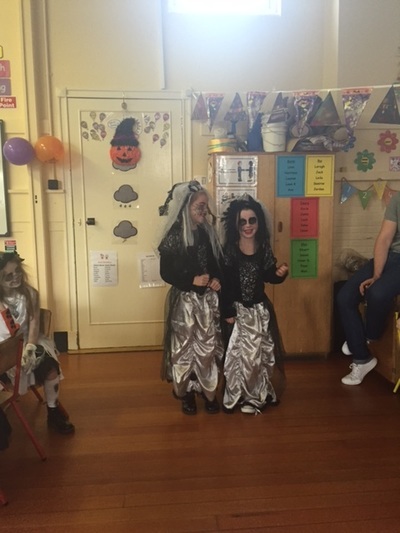 Well Done Mya and Kacie!! 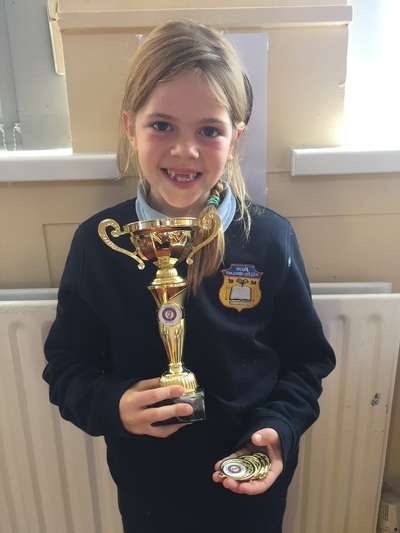 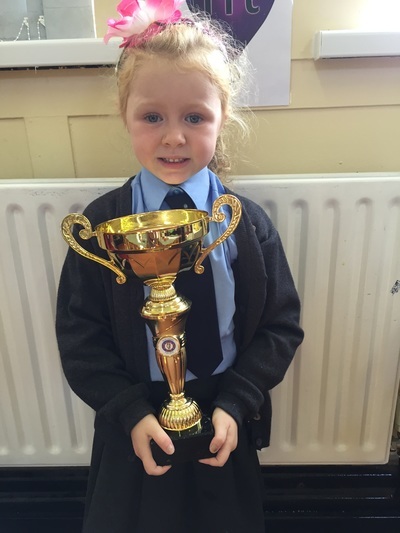 Mya and Kacie competed in a Feis over the weekend where they won these beautiful cups! Congratulations Mya and Kacie! 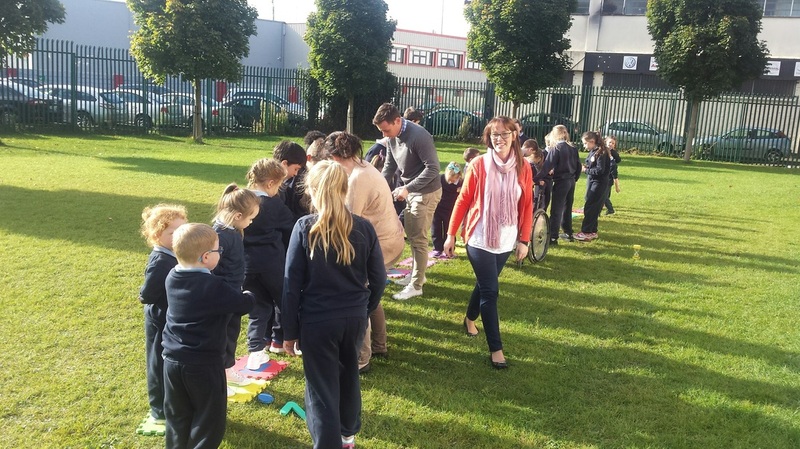 Book Reviews in the Sun!!! 1st and 2nd Class took advantage of the autumnal sunshine and did their Thursday Book Reviews outside!